How do you go about building a professional website for your furniture or interior design company? With a WordPress theme of course! These themes are built to look beautiful and give you the functionality to share company details and talk with customers without having to pay thousands of dollars or have development experience to do so. Interior design WordPress themes provide stock images, contact details, sliders, booking pages and more, all of which will help you improve your business and take it to the next level. These themes are also responsive and will look great not only on standard desktop computers and laptops but on smartphones and tablets as well. 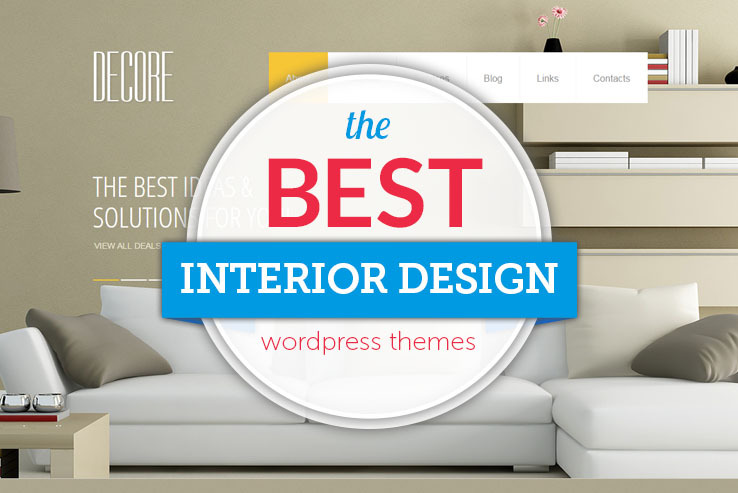 We compiled the top interior design and furniture WordPress themes to make the search a little easier for you; keep reading to find the best of the best. Have we missed your favorite interior design theme? Email us or leave a comment below with any links you feel should be included in our roundup! 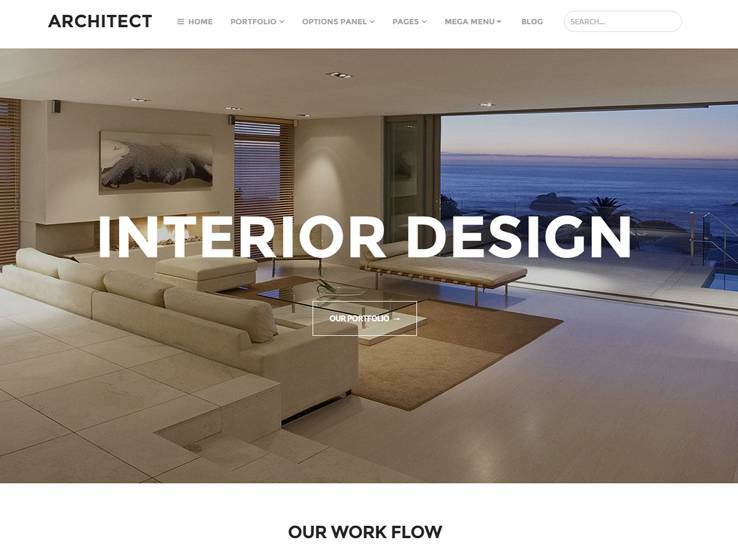 Architect by MyThemeShop is a beautiful theme for furniture stores and interior design companies because much of the theme is designed to focus on interior home layouts. Areas for stunning photos and thoughtful design puts focus on your content. The fluid, responsive nature of the theme means that anyone can view your site on mobile devices, and the portfolio post type ensures you can share your past work if you’re an interior designer. Beautiful blog layout and SEO features gives you a chance to boost your search engine rankings, while the drag-and-drop homepage sections give even the most inexperienced designers the ability to make a beautiful website. Parallax scrolling helps with grab your attention, and the Google Maps integration shows your physical location on your homepage without forcing clients to search all over your website. The theme also includes a handy counter, which is useful for sharing various statistics about your company. Finally, the contact form is ideal for customers to reach out to you if they have any questions. Design Portfolio by TeslaThemes has a responsive design which looks great on mobile devices. The large header area showcases some of your best photos, along with overlaying text. The main page slider lets you place several scrolling images on the homepage, perfect for promotions and testimonials, while the filterable portfolio page adds a convenient area for showcasing your past work. The built-in shortcodes are wonderful for both beginners and advanced users since you can quickly add items like pricing tables, testimonials, buttons, and progress bars. Social media support is included with the Design Portfolio theme and the integrated contact form helps you stay in touch with customers. The Google Maps module shares the geographical location of your shop by embedding a simple line of code. Along with Google Web Fonts, a Flickr gallery, Vimeo and YouTube support, and a 12-columns grid, the Design Portfolio theme is a powerful one. 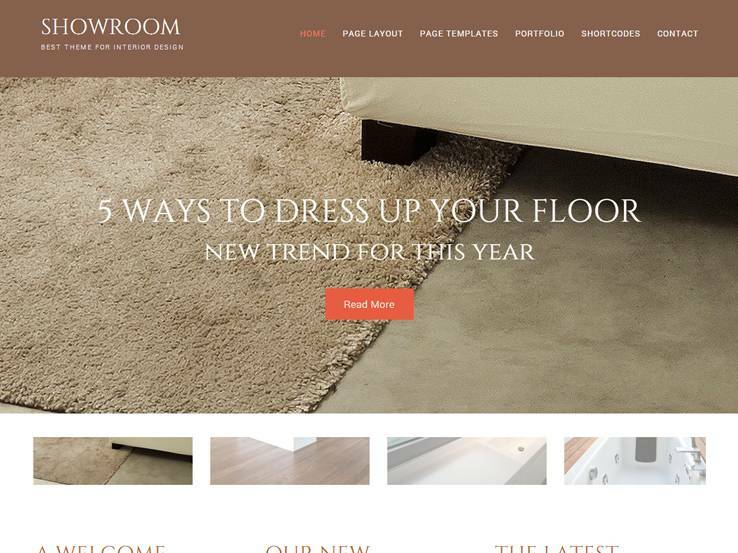 The Design ShowRoom theme by ZigZagPress is a multipurpose theme perfect for interior designers and furniture stores. A large slider showcases your work and products, and the theme has a responsive design that looks and performs great, no matter which device your visitors use. Three different page layouts are included with the theme and a full-featured blog allows you to share valuable content with your customers and to boost your SEO rankings. Share a portfolio with your clients and use some of the many shortcodes to add elements such as buttons, info boxes, pricing tables, and more. Several widgets are included with the Design ShowRoom theme, including an area for recent posts. 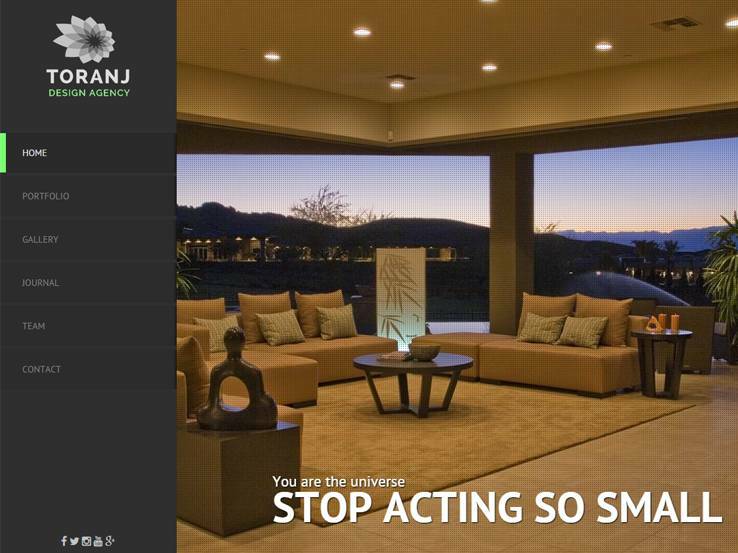 The theme also includes a contact page, making it easy for potential clients to reach you. The standout feature is the homepage slider, since it incorporates overlaying text and clickable buttons, allowing you to easily share a promotion or a new product. If you’re interested in a well-built theme that doesn’t require a huge time investment, this theme is a great choice. 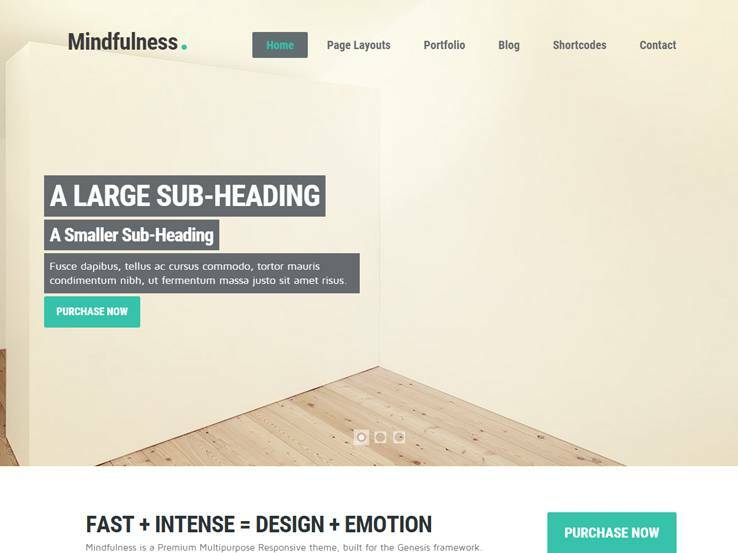 Consider the Mindfulness theme by ZigZagPress if you’d like a powerful, clean solution for putting the most focus on your products and services. The theme is completely responsive and offers various shortcodes to keep your hands clean of source code. Shortcodes allow you to make pricing tables, portfolios, client pages, testimonials, and sliders. The slider includes the ability to add text overlays and buttons, while the page layouts add variety. If you’d like to set up a portfolio for your interior design business, you get to change the format and categorize your portfolio items to make it easier for potential clients to find relevant work. The contact page and built-in blog ensure that your customers are always updated with the newest information; a blog is a sure-fire way to improve your search engine rankings. Along with full social media integration, the Mindfulness theme offers several widgets for contact information, recent posts, and your latest portfolio images. 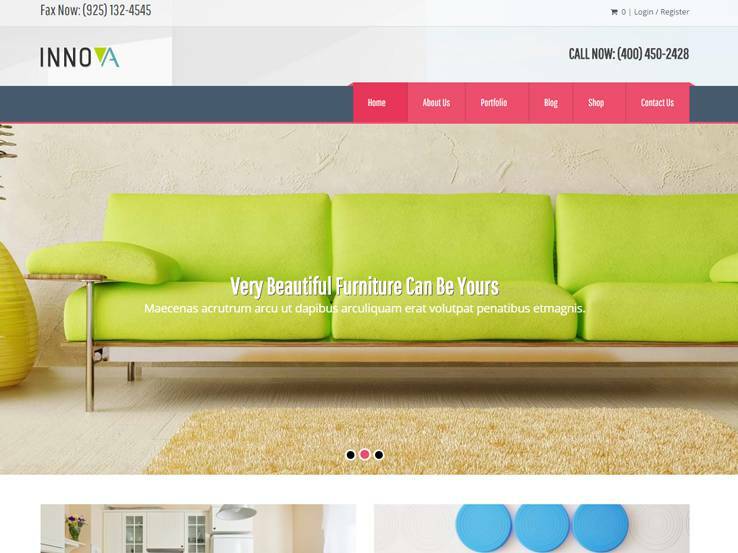 The Vanilla theme is another product from the folks at ZigZagPress, and it serves furniture and design companies well, considering the minimalist design which eliminates distractions and puts the main focus on your content. The theme has a beautiful slider with overlaying text options, along with branded social media buttons which encourage your visitors to follow you on your social platforms like Facebook, Twitter, and Instagram. The filterable portfolio makes it easy to bring in new clients and shortcodes help you add anything from buttons to sliders. The Vanilla theme provides a search bar and contact form, both of which improve your user’s experience. The page templates and layouts ensure variety throughout your site. The theme includes many widgets, helping you implement modules for contact information, recent posts, and even a tag cloud. All of these widgets can be placed in your footer or sidebars. If you’d like to build a strong portfolio to make a great first impression on potential clients, consider the Engrave theme. The theme includes plenty of white space and an elegant gray header, which incorporates a nice slider area with a content and button module to the right. Create a portfolio with filters so your visitors will have no problems finding the most relevant work. Use the shortcodes for designing buttons, drop caps, service boxes, and more. The contact page is a helpful method for keeping in touch with your customers and the page templates include a full-featured blog for interacting with your customers and giving them content that they can use to help them with products or services. Stunning widgets offer options for social media buttons, Flickr photos, contact info, recent posts, and a tag cloud. All of these widgets can be inserted into the footer or sidebar areas. The Furniture Company theme is one of the few options designed specifically for furniture companies. The theme is built to run on all mobile devices and the parallax effect is a great way to add visual appeal to your website. The built-in drag-and-drop editor is the standout feature that allows you to avoid custom coding. This is ideal for beginners, as well as advanced users who want to speed up the development process. 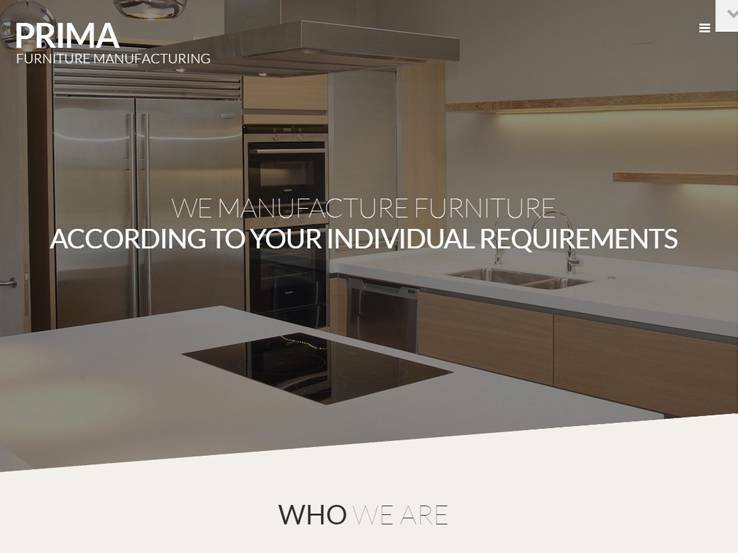 The mega menu allows you to add hundreds of furniture products, and the portfolio area works well if you provide any additional services such as interior design. 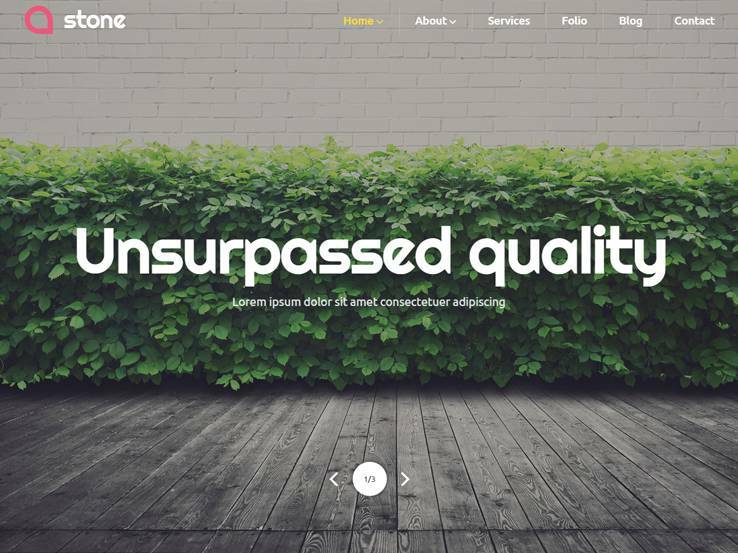 The theme’s header includes the parallax effect but it also provides overlaying text and button functionality, which sends people to new products and promotions. The blog works nicely for sharing content and the contact module shares the most important details with people wanting to get in touch with you. Keep in mind that the portfolio portion is actually called a gallery, but it looks beautiful once you start uploading images and creating filters to make it easier to sort your projects; this can also function as a regular photo gallery. 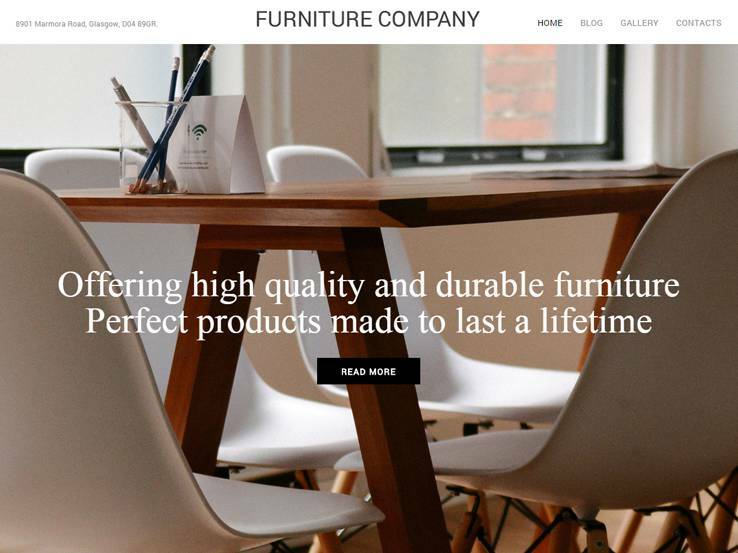 In addition to the blog, the Furniture Company theme offers several other pages such as an FAQ, testimonials page, and an area to share information about your team members, helping you brand your company and give you a great online presence. The Stone theme from Template Monster has a unique look with parallax scrolling and responsive design. Overall, this theme is a great choice for any company that wants to highlight certain elements of your interior design company with high-resolution images. A slider is situated at the top of the theme and it looks great when you incorporate overlaying elements like buttons and text. There are fun font icons, but the hallmarks of this theme are the counters, so you can easily show important information about your skills and experience to add credibility to your company. A mega menu is also available to add as much content as you can to your menus without overwhelming your visitors. Google Fonts are ideal for a little bit of branding, while the Google Maps integration leads your potential clients to your office. The theme includes some cool pages for highlighting your services, portfolio, blog, and FAQ. The contact form takes about two minutes to setup, and the shortcodes have all the functionality to quickly build elements such as buttons and columns. With shortcodes, you never have to touch source code if you don’t want to. 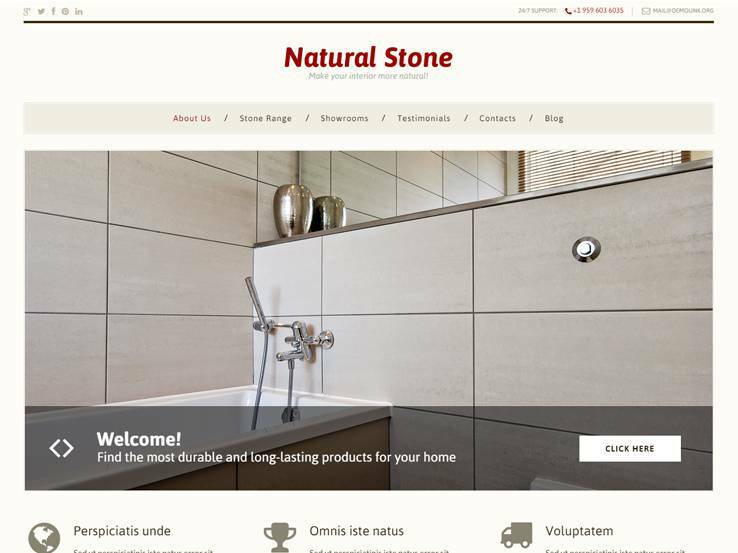 The shortcode builder, sidebars, and nice navigation settings, make the Stone WordPress theme a top choice for interior designers. The Minimalist Interior theme reveals a lot in its name but also has many different settings for responsiveness and dynamic changes. This is a fully editable theme from the back end, and it includes several custom post types. You can easily add posts that feature galleries, images, links, and quotes. The multilingual nature of the Minimalist Interior theme means that you can connect with people from all over the world. Over 80 shortcodes allow you to add various design elements without touching a single line of code. We like the Minimalist Interior theme for its design, but it truly has a wide variety of backend features to play around with. The theme includes plenty of white space to bring attention to your content. Multiple color options allow you to easily match the look of your website with your brand. Custom widgets are great for comments and social sharing, while the sliders improve the way you showcase events and new services. The advanced backup feature ensures that you can restore content in the event of an issue. Use the filterable portfolio to show off your past work and bring in new clients for your business. Overall, it’s a stunning theme with all the tools you need. 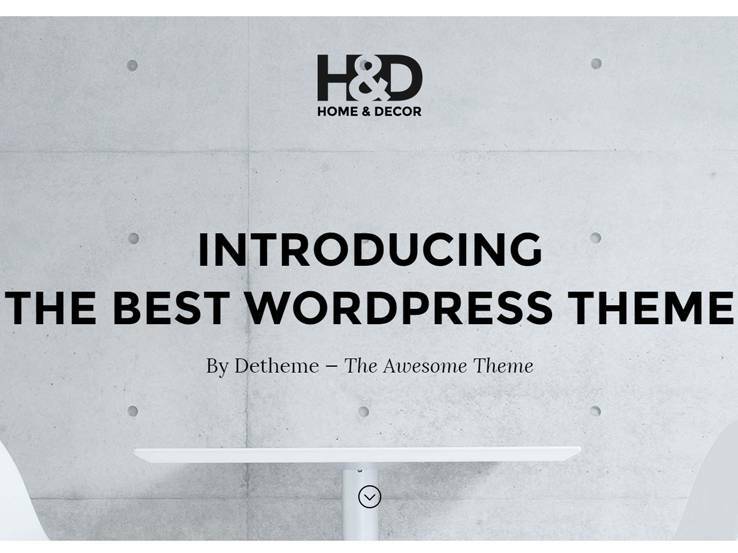 For a solid design and a beautiful, image-centric template, consider the Home Decore WordPress theme from Template Monster. The fully responsive design looks great not only on desktop computers but also on mobile devices such as tablets and phones. All of your content, including blog posts, is customizable in the admin area. You can change post types and colors, all with the click of a button. Custom post types allow you to add blog articles with galleries, photos, videos, and quotes. The Home Decor theme is multilingual and translation-ready meaning you can easily translate it into any other language. Additionally, the theme includes shortcodes that keep you from having to deal with source code. A two-step installation speeds up the entire design process. Advanced users and beginners alike benefit from it because they don’t have to spend much time setting up the theme. The theme also includes unlimited color options, making it easy to integrate with your brand. The filterable portfolio has the tools you need to feature your best work, which is critical for home decorators. Customize your typography easily and use the advanced backup to bring back your original content in case something goes wrong. 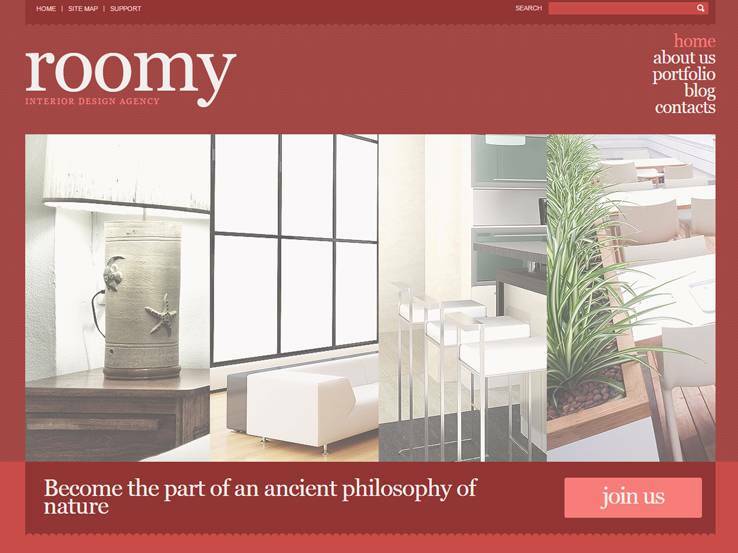 Roomy is an elegant interior design WordPress theme that has a unique slider banner for showcasing your latest designs. A prominent call to action is included so your visitors can immediately go to your booking form or your services page to find out more about what you offer. Below that, you can post a brief description about various types of interior design you offer along with a link to the latest blog posts where you can share details about your creative process and inspiration or talk about particular interior design styles. Make use of the blog page to improve search engine rankings, and build social proof with testimonials and logos of past clients. Present samples of your decorating style with a beautiful portfolio. The entire footer is widgetized so you can use it to share a list of your recent blog posts, display your contact details, and link to your social media followers so visitors can follow you and stay up to date with your work. The theme can be completely customized in terms of fonts, colors, and much more on the backend and you can even take the customization a step further with shortcodes to add buttons, columns, lists, and more to your pages. Along with translation files and a responsive design, the Roomy theme is powerful so be sure to check it out. Consider the Zoltan theme if you’re a fan of minimalist design. The theme features a stunning slider that links to your latest projects so potential clients can immediately see your style and what you have to offer. Showcase your projects through the portfolio section and use the blog page to talk more about each project. You can also feature members of your team, making this a great choice for interior design agencies–post testimonials from previous clients and include logos of your preferred brands. A contact section is also included on the homepage that features a large Google Map to show your physical location. The theme allows for plenty of customization and you can easily modify fonts, colors, upload your own logo, and adjust the layout through the theme options panel. Over 80 shortcodes are included in the theme so you can add buttons, columns, and more without touching a single line of code. Localization files are included for translating your website and connecting with a diverse audience. 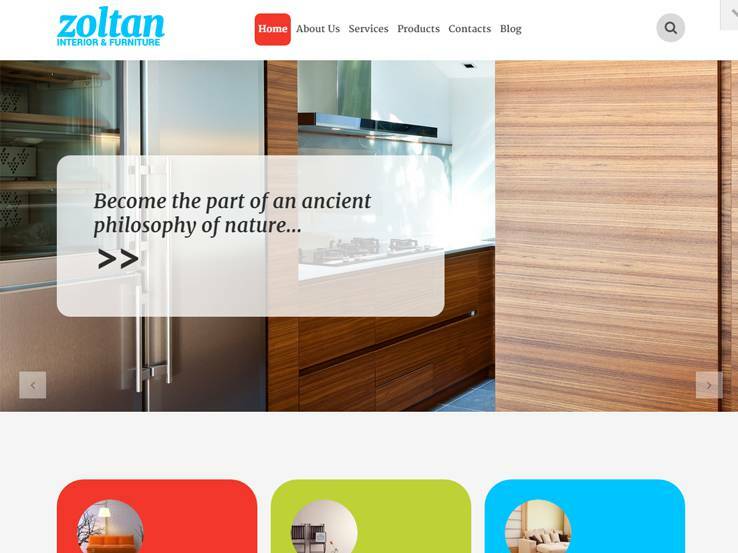 The Zoltan theme is completely responsive and looks great on most devices. On top of that, it features a 2-step installation process, SEO optimization, and an advanced backup system. Decore is a great choice for any company that sells custom-made furniture. Grab the attention of potential customers with this theme by including a video catalogue and presentation of your furniture. You can also share furniture specializations as well as any additional services you might have to offer, such as furniture repair. Feature logos of your partners and take advantage of the gorgeous slider to display your best products. 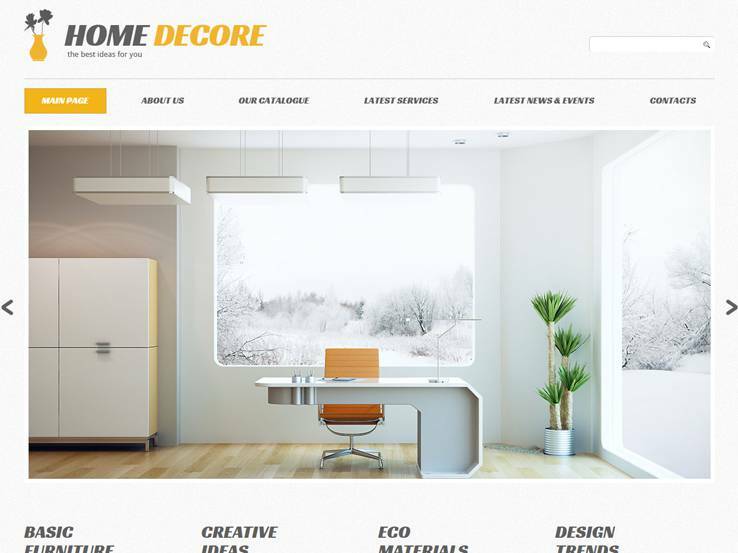 The Decore theme allows you to easily integrate your brand with your website by changing colors, fonts, and uploading your own logo and favicon. The theme is responsive, which means even visitors on mobile devices will be able to see everything you have to offer without display issues. Create lists and buttons without having to delve into code with custom shortcodes and translate your entire website so you can expand your reach to an international audience. Finally, the theme is fully SEO optimized which guarantees your search engine rankings will improve. 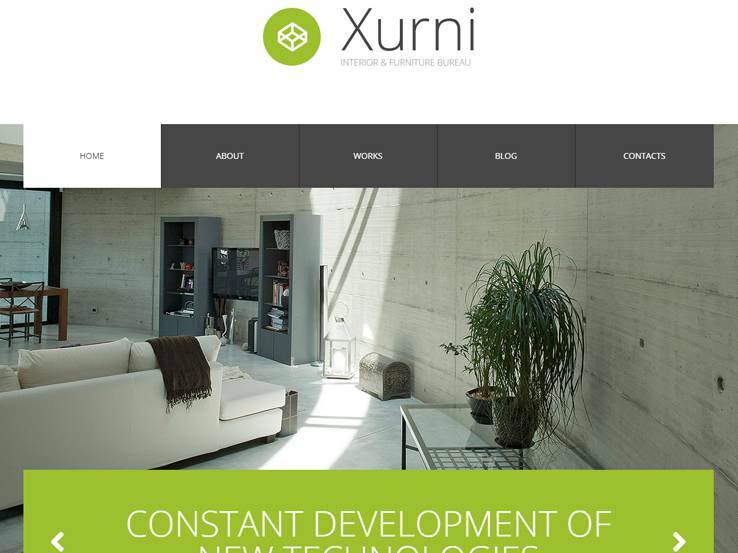 Xurni is a clean and stylish theme designed specifically for interior design and furniture businesses. The responsive template ships with beautiful galleries and catalogs to showcase your products or projects as well as an attractive fullscreen slider to highlight your best projects or promotions on the homepage. The portfolio module has 4 different styles to present your work. You’ll also find custom page templates for testimonials, contact us and FAQs pages. Furthermore, the Xurni theme includes social media icons and a blog to share valuable content and generate traffic to your website. Prima is a bold, elegant WordPress theme designed to help you showcase your products or projects and gain more clients for your business. The template is photo-friendly, including a fullscreen image slider on the homepage as well as a gallery with large banners. Different sections are available to present details about your interior design and furniture business. You can add testimonials from your happy clients to boost sales, and there’s also a blog to share tips and relevant updates relating to your business and industry. The Art Deco theme is 100% responsive and fully editable, meaning your website will render correctly on all device types and you can customize every aspect of the template to match with your style. The beautiful theme comes with fantastic features to help grow your business online, including an elegant header area that incorporates a fullscreen image and overlaying texts and buttons that act as calls to action. 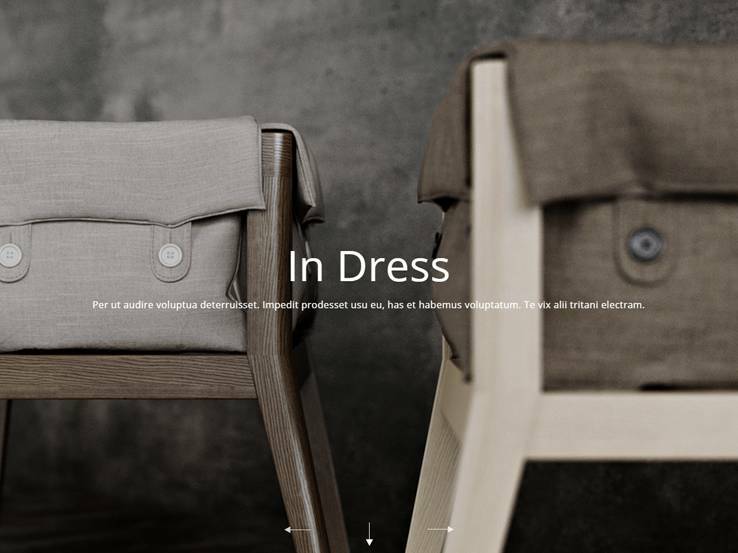 A stylish portfolio is included with the theme to let you showcase your brilliant projects. Moreover, you’ll find Google maps to help potential customers find your geographical location more easily and quickly, testimonials to build credibility, social icons, a blog section and a professionally designed contact page. 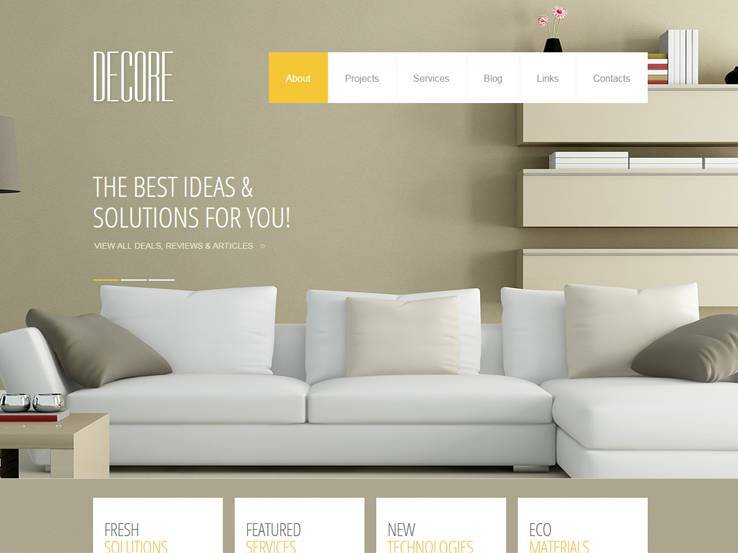 Stone Decor is the perfect WordPress theme to build your interior design website. It has a clean and modern design with well-organized layouts to accommodate all the vital details about your business. To start with, you can display your contact information and social media icons right at the top where they’re unmissable. A beautiful slider welcomes visitors on the homepage, and it contains overlaying text and a call to action button to drive users farther into your website. The portfolio is filterable, so people can find specific projects much quickly. Potential customers will have no problem finding your physical location thanks to the integrated Google maps, and they can easily get in touch with you through the contact page. Along with testimonials, social media integration, and a blog to share valuable updates and tips, the Stone Decor theme is certainly worth your penny. 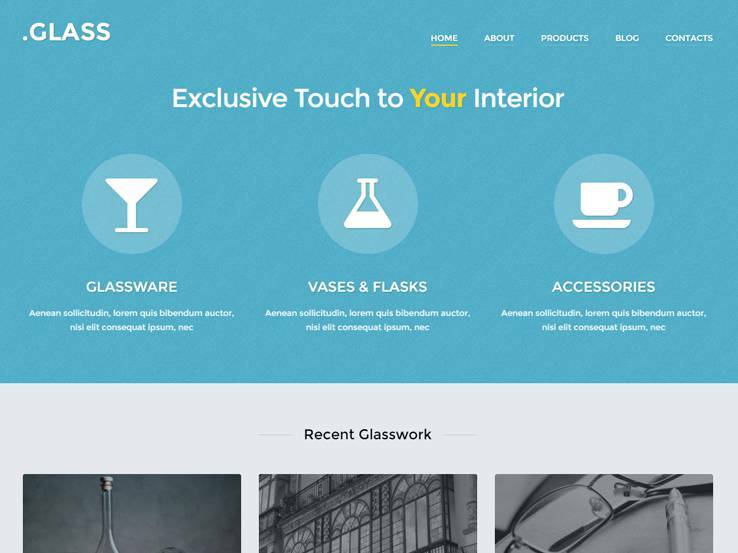 Glass is a clean, sparkling WordPress theme that suits interior designers and furniture business owners. The versatile template incorporates many great features, including a fullscreen frontpage slider to highlight your promotions and projects, a portfolio with 4 layout styles, and testimonials to help grow your reputation. The fixed menu bar improves site navigation, so users will be able to find the information they need much faster. Besides, there’s a contact page for potential customers to easily reach you and a blog that’s perfect for growing the traffic your website gets. The Creo Furniture theme is another fantastic option for furniture shops and interior designers alike. It has an elegant design and lots of easy-to-use features to help grow your business. Showcase your projects or products with a feature-rich portfolio that has 4 layout options, add testimonials to boost your credibility, and implement Google maps to help potential customers find your location easily. An attractive image slider sits elegantly on the main page, and it’s perfect for showing off your best products and creating a strong first impression. Potential customers can easily get in touch using the contact page. Also, you’ll find a blog to share tips and updates and boost the amount of traffic your website gets. 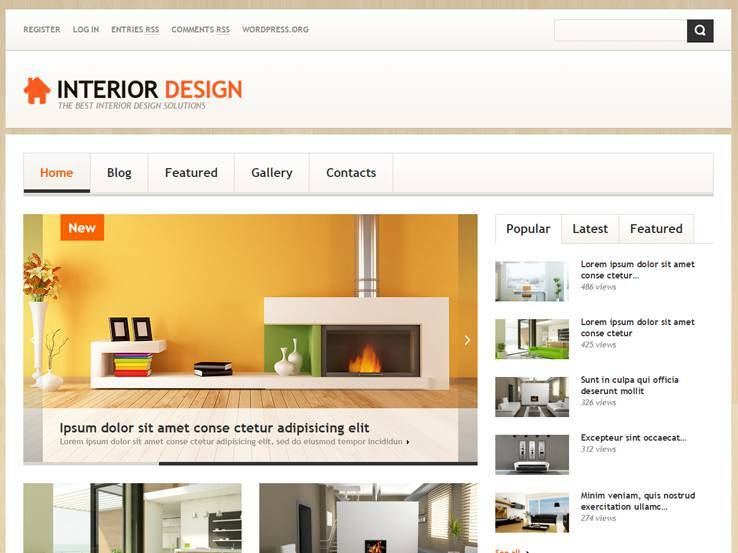 Meet Interior Design, a responsive and user-friendly WordPress theme with many useful features to grow your business. The template makes it easy to showcase your projects thanks to an attractive frontpage slider and a feature-rich gallery that has 4 layout options. Several pre-designed page templates are included with this theme, including testimonials, FAQs, and contact us. 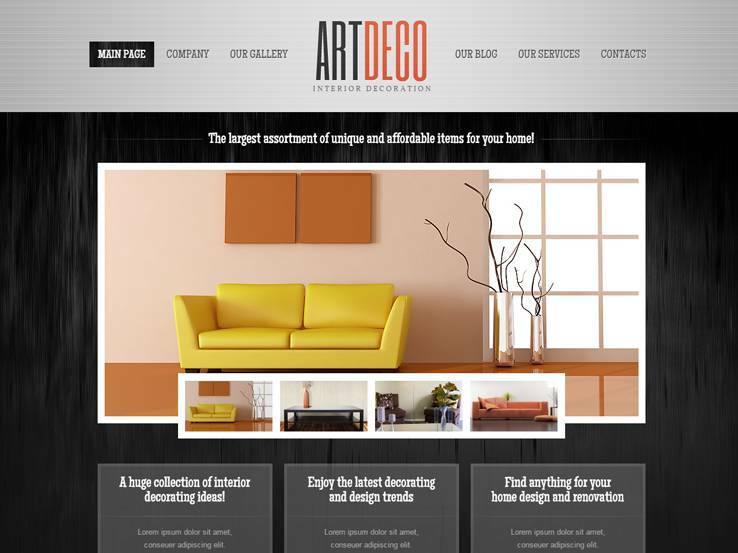 Also, the Interior Design theme comes with a blog, which is perfect for boosting your search engine rankings. Want a WordPress theme with a professional design, great functionality, and that’s easy to set up and operate? If yes, consider the Art Decor theme. With this template, growing your interior design or furniture business will be enjoyable. It comes with many useful features, including galleries to present your projects, beautiful testimonial sections, and an image slider that supports overlaying texts and buttons. You can add your contact details and social media links at the top where visitors can easily notice them. In addition, the Art Decor theme ships with several pre-made page templates, including a contact us page with Google maps for potential customers to easily reach you. 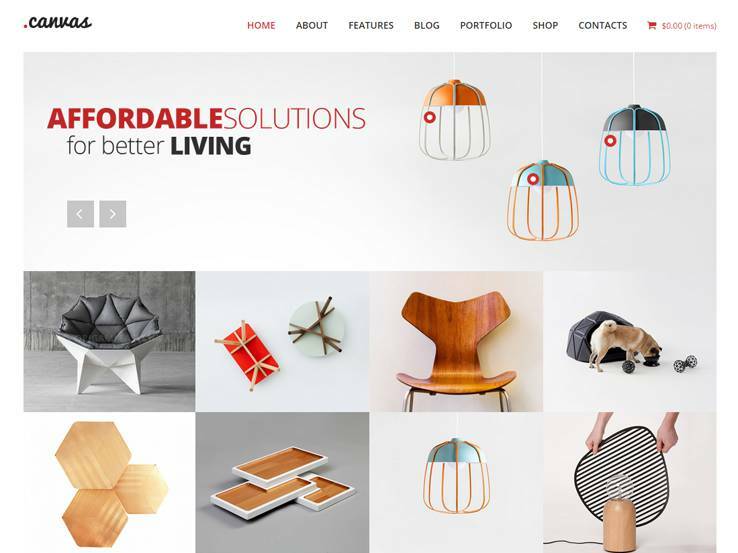 Build and Renovate is another great WordPress theme suitable for interior design and furniture websites. Designed to help you establish a competitive online presence, the template is packed with awesome features such as a fullscreen slideshow on the homepage and a portfolio that lets you present your work in 4 different styles. You can have your site up and running within minutes thanks to the 2-step installation process and the pre-designed page templates that are included with your purchase. You’ll find templates for testimonials, about us, FAQs and contact us pages. 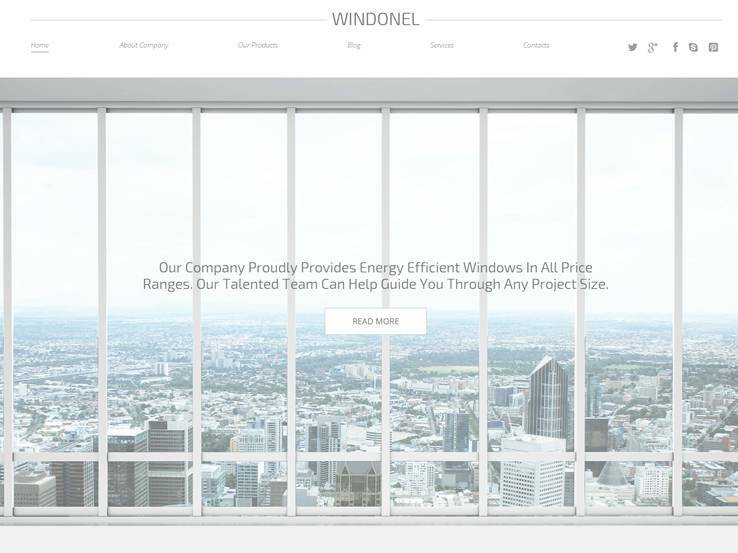 The Windows theme has a beautiful design with pleasant sections to share the details of your firm, large image banner areas to show off your products and projects, and lots of other impressive features. The homepage contains a gorgeous image slider in the header, which is perfect for highlighting your best designs. A number of page templates are packaged with the Windows theme. These include testimonials to share client feedback, FAQs, about us, contact us, and 4 different layouts for your services pages. You’ll also love this template’s footer, which has space to add your contact details and social media icons. Deco Interior Design is another fantastic interior design and furniture theme in our collection. This one features stylish elements, gorgeous image areas, a filterable catalogue to present your projects among other beautiful features. An eye-catching slider welcomes visitors to your homepage. The template is highly customizable, so you can style it according to your preferences. Besides, it includes page templates for useful sections such as testimonials, about us, and contact pages. 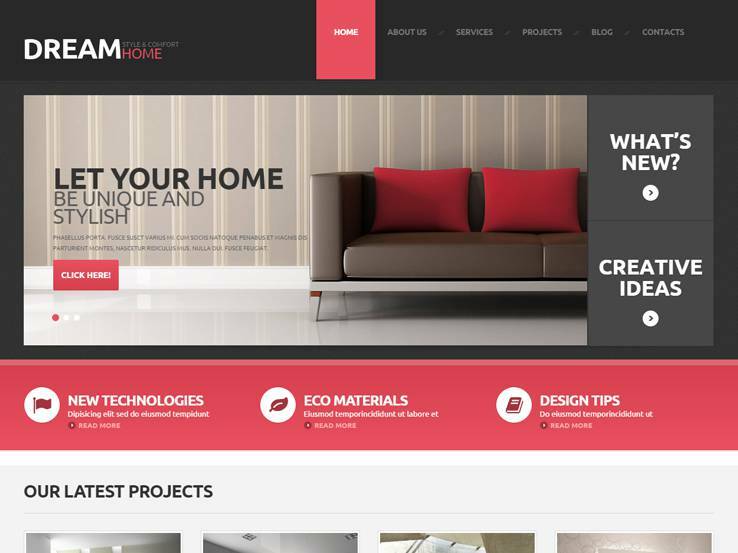 The Home decor theme is fully responsive, so potential customers will be able to find you without problems on smartphones and tablets as well as on large desktop screens. 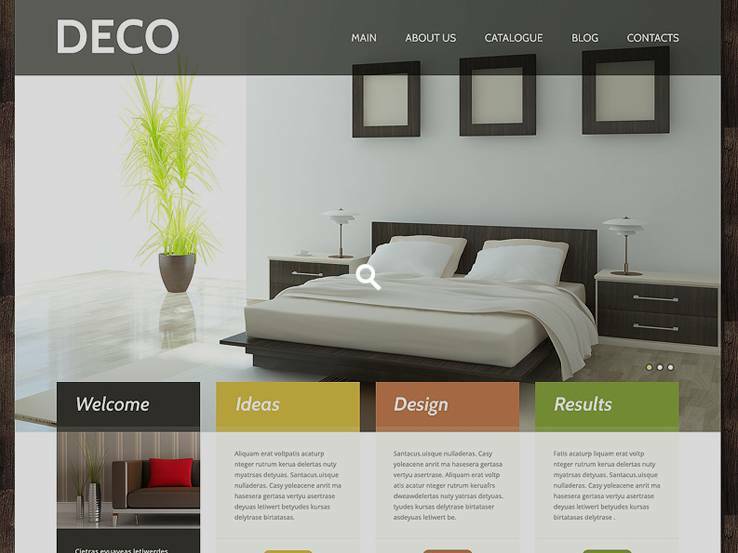 The template is perfect for designers and furniture shops alike. 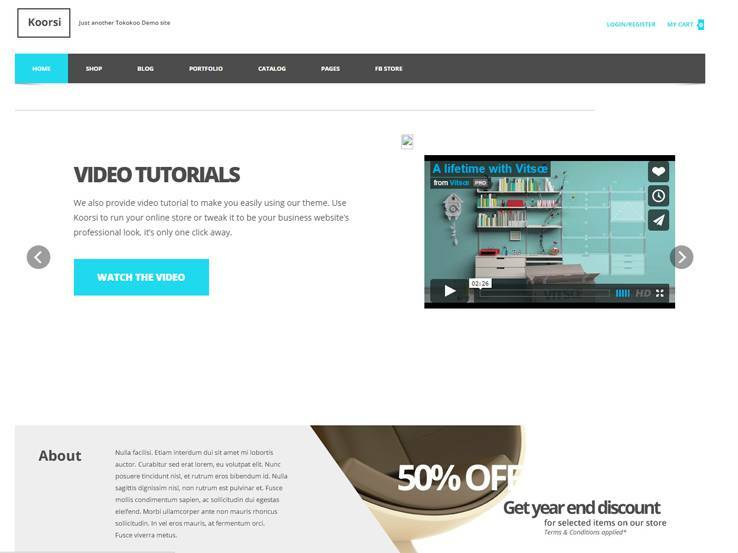 It has an awesome catalogue module that supports video presentations, a beautiful frontpage slider to feature your projects and products, and several page templates that will save you time when setting up your site. A pre-made contact page is packaged with the Home Decor theme, and it includes a Map for potential customers to easily find your geographical location. Along with social media integration, a partner logo section, and multiple customization options, the Home Decor theme is right there at the top. 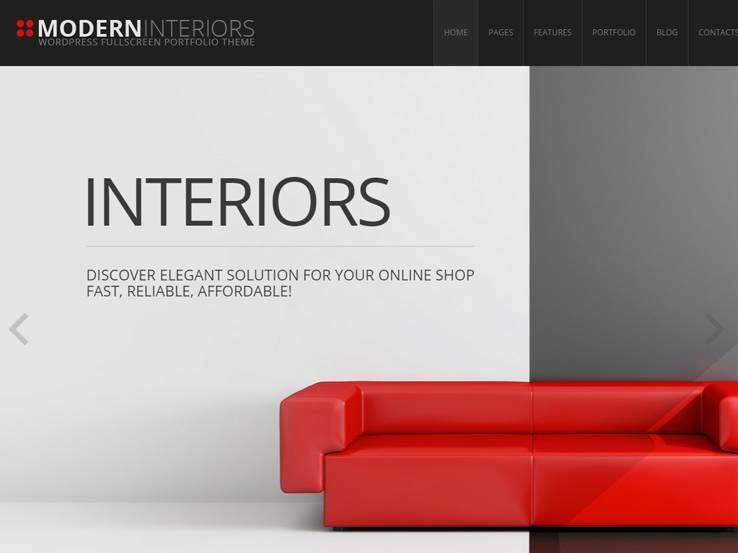 The Interior theme is a great solution to help bring your interior design and furniture business online. The fully responsive template packs many great features, including galleries and portfolios to showcase your projects and products, a pre-made contact us page complete with a Google map, testimonials, and more. A blog is included with the theme, and it’s perfect for sharing valuable content and generating more traffic from search engines and social media. You’ll also find translation tools, multiple customization options and free lifetime updates. 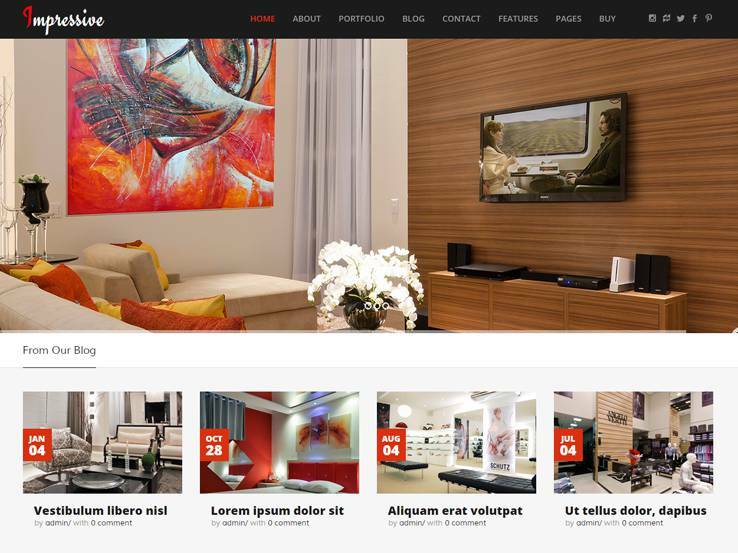 Windonel is a nice, clean-looking WordPress theme with useful features for furniture stores and interior designers. The template’s standout feature is the portfolio, which offers 4 layout styles to present your work. 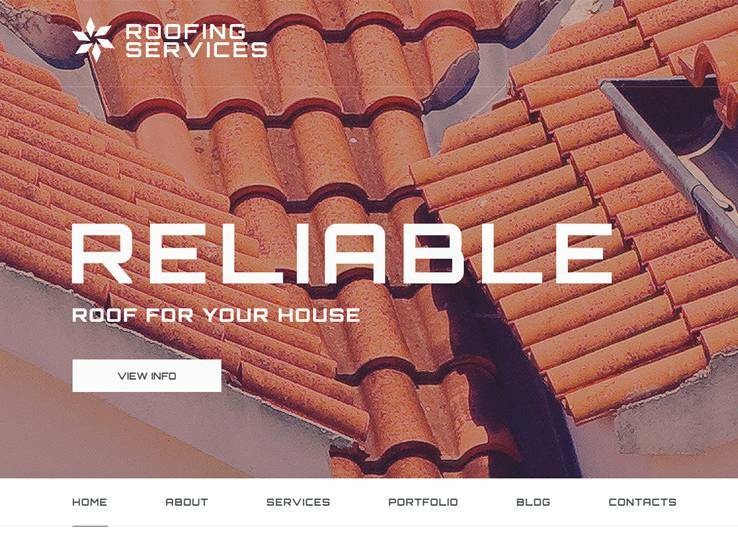 The homepage contains a large header area, which includes text and button overlays, an image slider to showcase photos of your best designs or products, and other beautiful sections to present your firm’s details. Many customization options are available, so you’ll have no problem modifying the template to match with your style. Additionally, you’ll find social media icons, page templates, a pre-designed contact page, and a blog to help grow your website traffic. 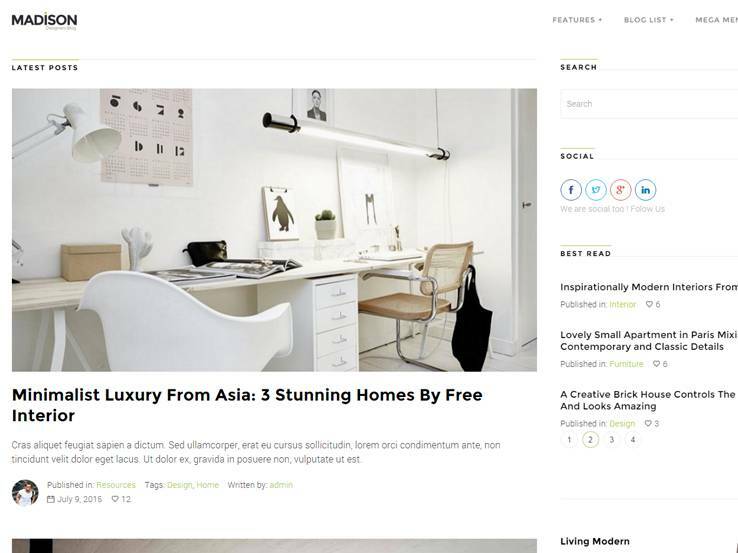 Meet Dreamhome, a clean, modern and stylish WordPress theme. Perfect for both interior designers and furniture stores, the template brings brilliant features such as a projects module to showcase your past works, a classy slider to highlight your best projects as well as video support. The portfolio module has 4 different design options, allowing you to present your projects in a variety of ways. To make the setup process easier for you, the Dreamhome theme includes a number of pre-designed pages for important sections such as testimonials, about us and contact us pages. The contact page includes a Google map, and there’s also a blog to share valuable content and social icons to connect your website with platforms like Facebook and Twitter. Consider the Interior Design theme if you’re looking for a responsive, flexible and easy-to-use template for your interior design website. The theme’s main page is stylish and well-organized, featuring a neat slider in the header, and overviews of your latest projects and photos below. Unlike most themes in this collection, the Interior Design theme includes several advert spots. It also comes with a blog to help generate more traffic, a ready-made contact page and multiple customization options to make it your own. 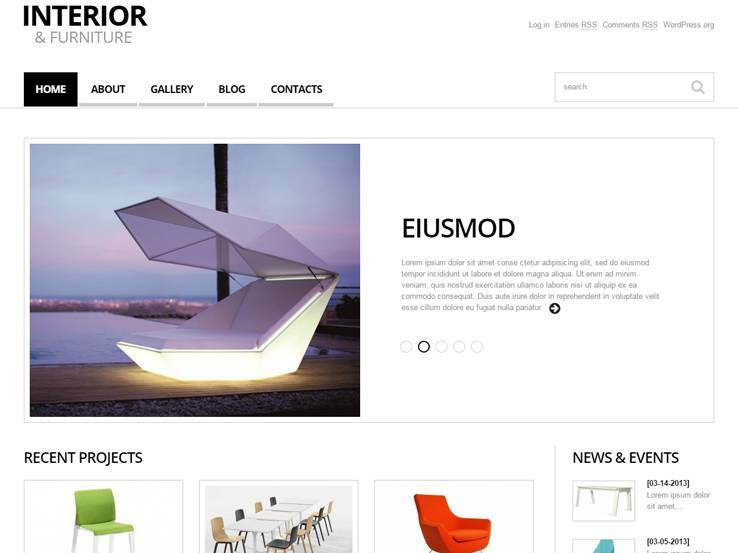 Here is another modern and stylish WordPress theme to create your interior design website with. It contains a set of fantastic features and options to help bring your business and services online. The gallery module brings 4 different layouts, and you’ll also find a portfolio section to share your projects. To help save you time, the theme is packaged with a number of templates for pages like contact us, testimonials and about us. 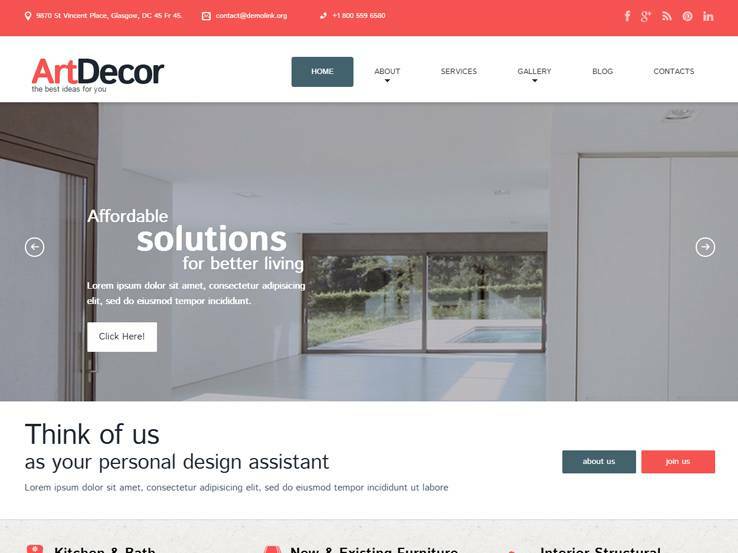 Along with multiple color options and hundreds of Google fonts to help you achieve a unique website, custom widgets, a user-friendly theme customizer, and free lifetime updates, the Decor and furniture theme is certainly worth checking out. 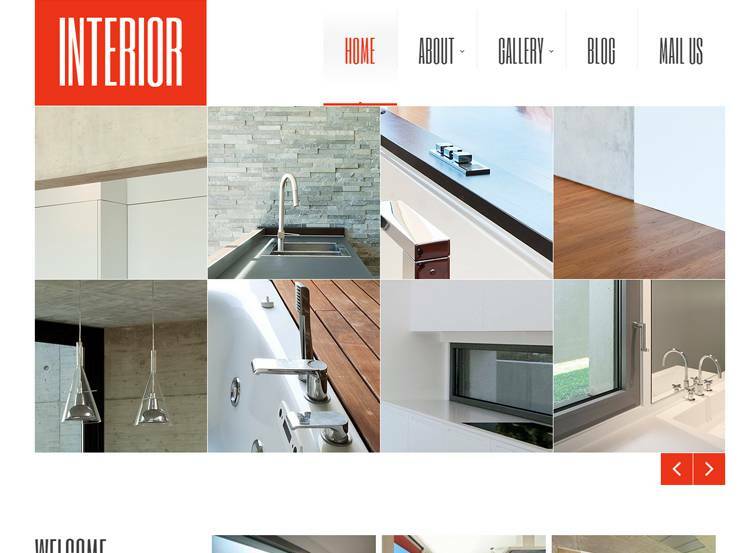 Interior Design is a simple and modern WordPress theme that puts your images at the front. It offers great tools to showcase your projects and products online and improve your business. The gallery provides 4 layout options for sharing your photos, and there’s a stylish slider to highlight your offers and promotions on the frontpage. Large social media icons are available to connect with your favorite social networks. Along with that, you’ll find a ready-made contact page for potential customers to easily reach you, a blog to help grow your traffic, custom widgets to easily add more functionality to your pages, and multiple color options and hundreds of Google fonts to help make your website unique. 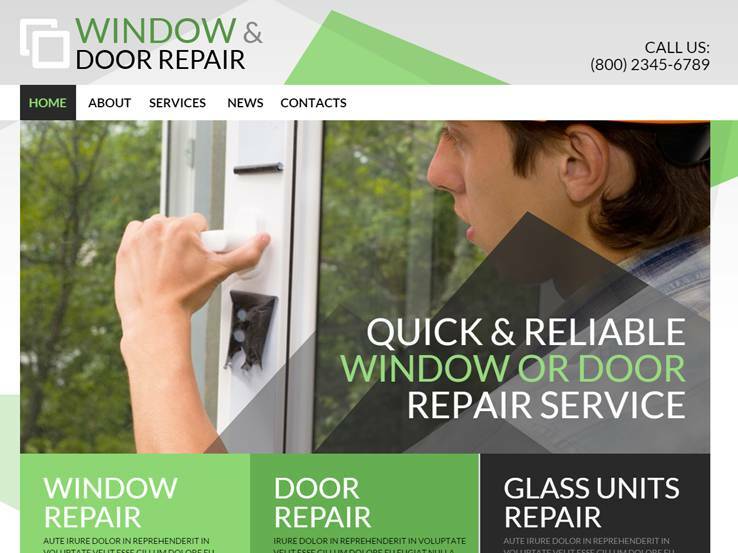 Home Renovation is another modern design with beautiful typography, well-thought content blocks to present your company details elegantly and multiple customization options to help you achieve a truly unique website. Share your portfolio in 4 different designs, add Google maps for potential customers to easily locate you and share testimonials from your happy clients for the ultimate social proof. A large logo area, multiple color options and customizable typography will help you build your brand. Better still, there’s a spot at the top to display your phone number as well as a pre-made contact page for people to get in touch with you easily and quickly. You’ll also find a blog to share tips and other valuable updates and an in-built theme customizer for controlling the look and feel of your website. 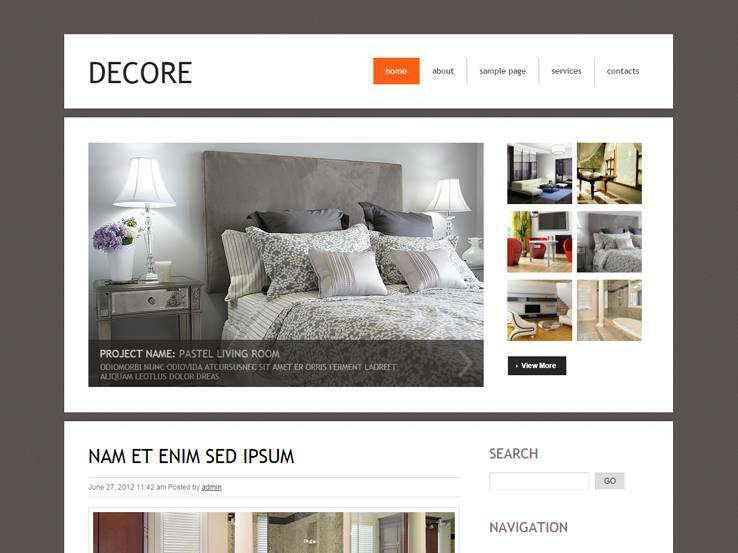 The Decore theme has a beautiful header section with a stylish image slider to show off your best designs, projects, promotions and other important content. Galleries are also included with the template, so you can showcase more of your beautiful works. In addition, the Decore theme is packaged with a pre-designed pages, including about us and a contact page for potential customers to talk to you easily. You’ll also find a blog, which is perfect for sharing tips and generating traffic from social media and search engines. 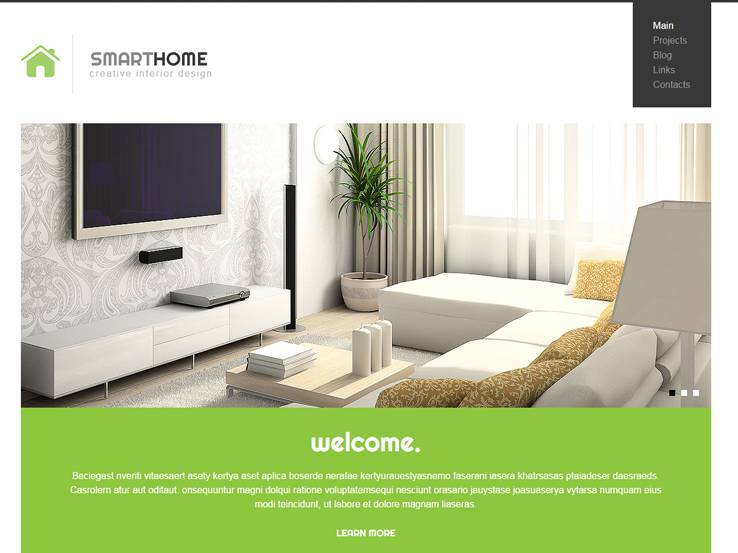 The SmartHome theme is a wonderful option for interior design and furniture companies. The template has a beautiful design and lots of modern features. It’s fast-loading, easy to install, and it looks elegant on all devices. Share photos of your amazing designs using the attractive sliders, and present your work with a filterable portfolio that makes it easy for users to find specific projects. At the back-end, you’ll find a wide range of customization options, including multiple color options, hundreds of fonts and custom widgets to add things like social sharing icons to your pages. You’ll also have a clean and simple blog section to share your knowledge as well as a ready-made contact page. The Glass theme is a fantastic choice for furniture and interior design companies, considering it has a clean and professional design and many easy-to-use options for presenting your business, services and works. The template features a large fullscreen slider on the homepage, a portfolio module with 4 different layout options and a pre-designed contact page that contains a handy Google map. A number of page templates are packaged with the Glass theme, so you won’t need to create pages for things like testimonials, about us, services and FAQs from scratch. Besides, the theme includes an events calendar, a blog section and translation tools in case you’d like to display your website in another language. The Furniture And Interior theme is designed to put your projects at the forefront and to help you grow your interior design and furniture business. It has large image backgrounds, which are great for showing off your products or projects, bold call to action sections, Google maps to help potential customers find you more easily, and a pre-designed contact page for people to connect with you. The portfolio module has four different designs, and you’ll also find pre-made page templates for testimonials, about us and FAQs. Also, the theme is translation-ready and social media-friendly. And in terms of customization options, the Furniture and Interior theme is fully editable, so you can modify almost all its aspects according to your needs. 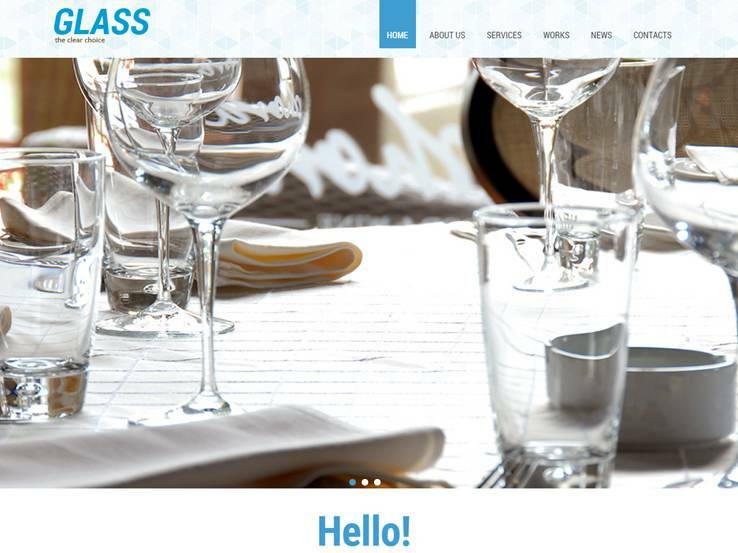 Consider the Glassco theme if you want a modern and fashionable template to establish an online presence for your furniture or interior design company. 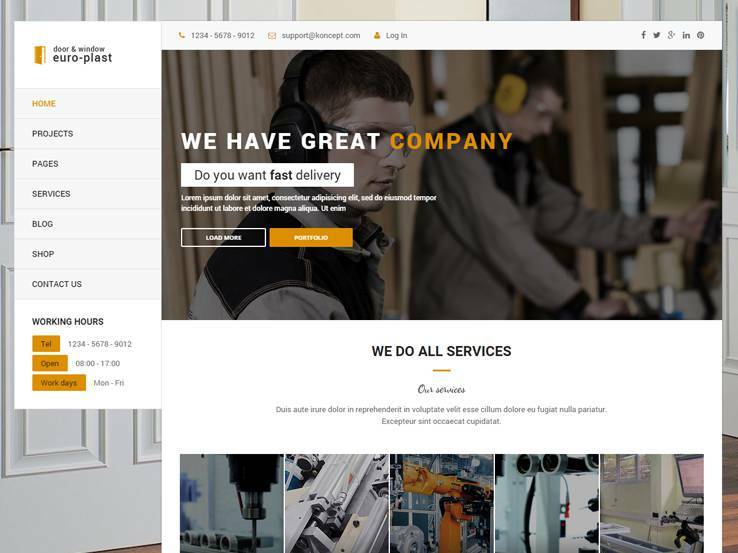 This template has a pleasant design with a gorgeous frontpage slider and well-organized sections to feature your company’s details. The template comes with a number of page templates, including a portfolio that provides 4 different ways to present your products or projects. You’ll also find a ready-made contact page, a testimonials module, social media icons and a blog to share valuable content. 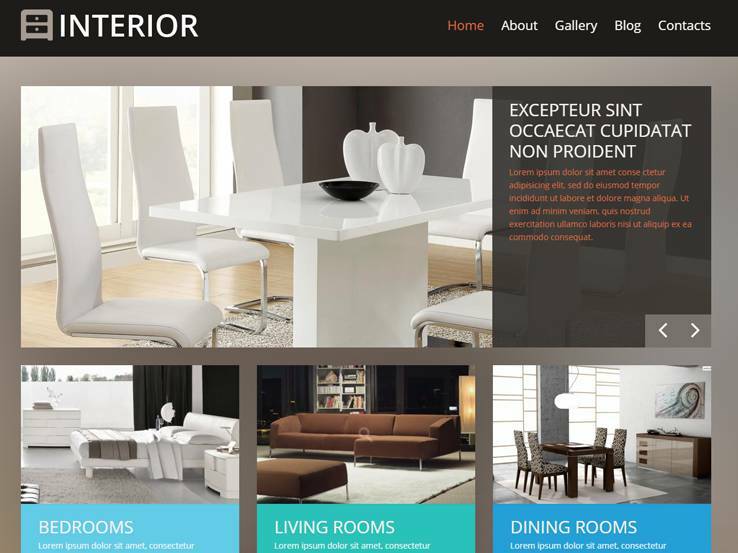 Meet Interior Design, a simple professionally-designed WordPress theme suitable for interior designers and furniture firms alike. It has a unique design featuring a fullscreen header banner with the navigation menu right below. Share your projects or products in 4 different ways and highlight your best designs using the gorgeous image sliders. Google maps will help potential customers find your exact location faster, while social icons make it easy for people to connect with you on different social media platforms. Besides, the Interior Design theme is super easy to install and configure, and it brings with it several pre-designed pages that will greatly reduce the amount of time spent creating your website. 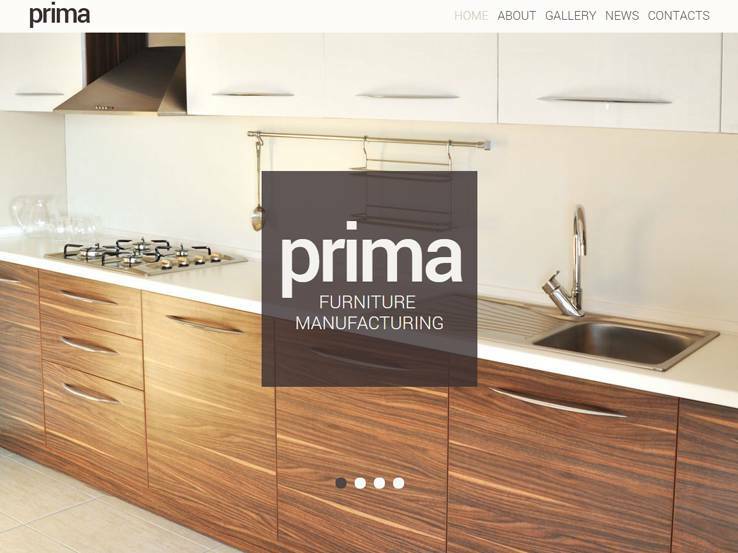 Prima is a sleek and modern WordPress theme with many superb features and easy-to-use options. Building your interior design or furniture website will be easy and enjoyable thanks to a powerful drag-and-drop site builder that needs no prior coding knowledge on your part. A stylish slide-out navigation menu adds to this template’s beauty, and it’s sure to impress users on mobile devices. The theme’s sections look elegant, and they allow you to share all the important details of your business – from your company profile and services to your contact information. You’ll also find social media icons and a dedicated blog to share your knowledge and increase traffic to your website. 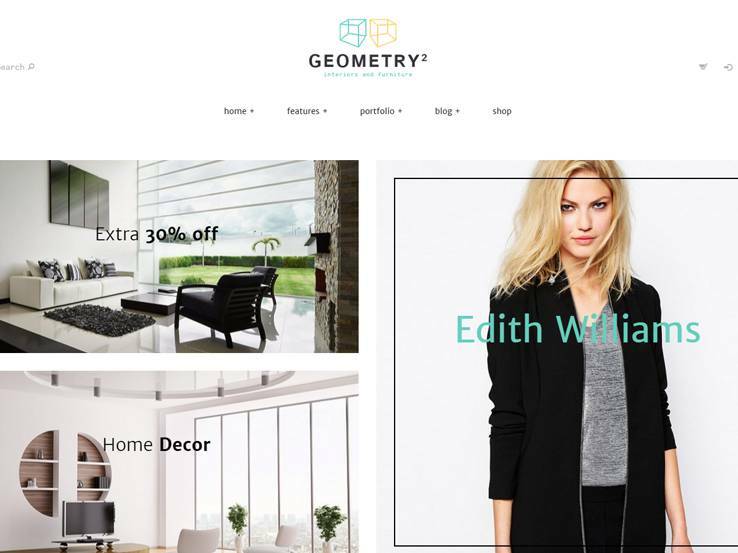 From ThemeRex comes Geometry, a fully responsive and highly customizable theme designed to turn your visitors into paying customers. 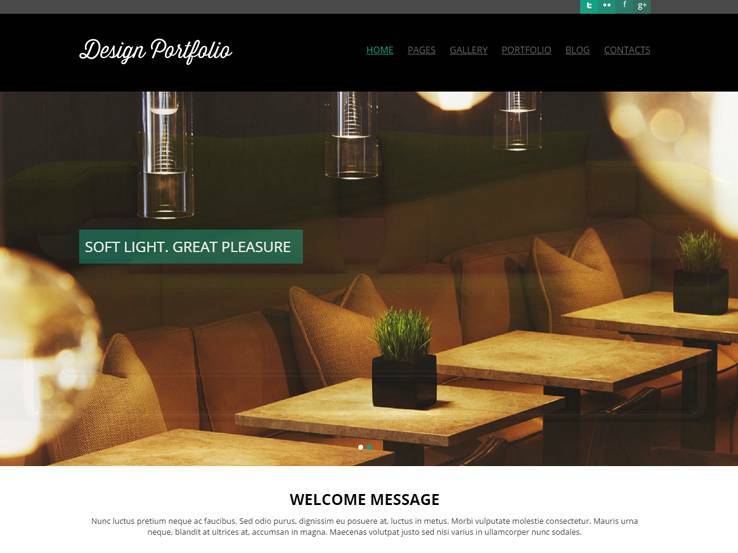 Perfect for interior design companies and furniture shops, the template has a photo-friendly design, an advanced portfolio with three styles and an online shop module for you to easily sell your products online. The theme comes with 4 homepage layouts, so you’ll have different design options for your site’s main page. In addition, the Geometry theme includes a blog, and you can display client logos on the frontpage along with your contact details. You’ll also find social icons, a drag-and-drop site builder, beautiful sliders and translation options. The HnD theme offers a fast and easy way to establish an effective online presence for your interior design firm. It comes with many useful in-built features and integrates nicely with a number of premium plugins that enhance its functionality. To start with, the theme comes with several demo designs which can be easily installed with one click. You can also create your own custom layouts using a beginner-friendly drag-and-drop page builder. Another powerful feature of the HnD theme is the portfolio module which offers a wide range of options for presenting your projects. You’ll also find eCommerce support, beautiful sliders to highlight your best projects or offers as well as translation tools to display your website in your preferred language. Want a slick and modern design to present your interior design and furniture portfolio? If yes, then try the Canvas theme. The template brings a feature-rich portfolio module that offers many beautiful options for sharing your projects and products with the world. The theme’s homepage offers two display options – one combines a slider at the top with a grid portfolio below, while the other features a slider with shop items. We also enjoy the pre-designed contact page, which includes a map to help potential customers find you easily. Along with social media integration, eCommerce features, galleries and Mailchimp support, the Canvas theme is designed to impress. Trojanj is an elegant award-winning WordPress theme that offers lots of useful options for creating your website. It comes with 5 homepage variations, 6 portfolio layouts, 12 gallery styles and 6 blog layouts. With it, you can easily establish a truly unique website that matches the needs of your interior design firm or furniture company. The Trojanj theme brings a number of page templates, including team members and contact us pages. eCommerce integration means you can start selling your products online within minutes, while social media icons make it easy for people to connect with you on different social platforms. Also, you’ll find translation tools, a user-friendly page builder, navigation options and much more. Consider Suarez if you’re looking for a clean and modern WordPress theme with lots of easy-to-use options to build your interior design website. 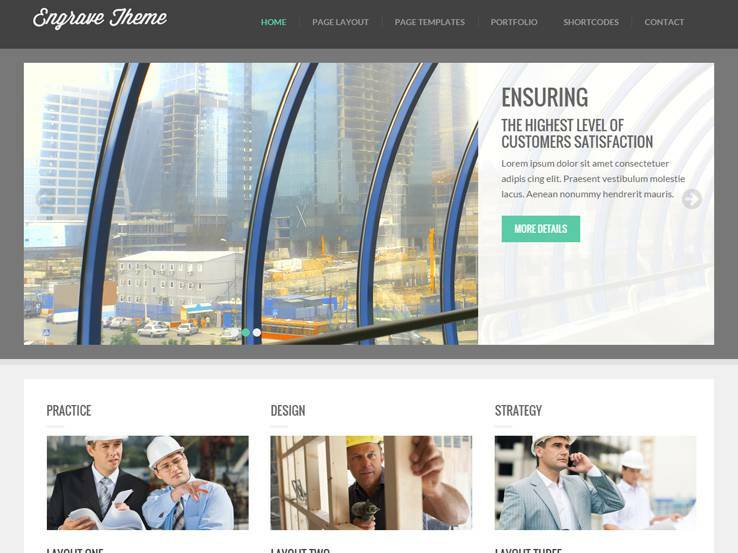 The template comes with over 50 demos, including 2 layouts dedicated to interior design companies. You’ll also find custom post types for sharing your team members, testimonials, pricing packages, and more. eCommerce integration allows you to setup an online shop within minutes, and you can also translate the theme to other languages thanks to the available translation files. Furthermore, the Suarez theme is fully responsive and it comes with a number of premium plugins such as the Visual Composer and Revolution slider, so you won’t have to separately purchase these plugins. 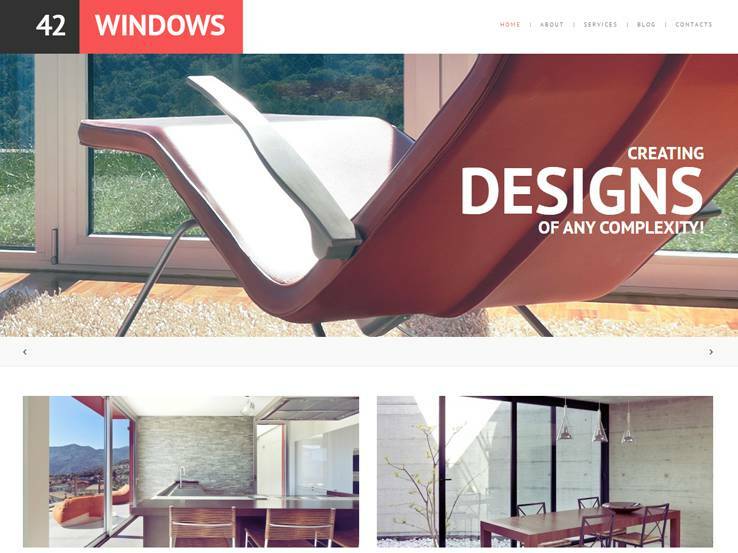 The Impressive theme is a great choice for your furniture or interior design website. Easy to use and with a simple, modern design, the template brings an impressive feature-set that includes image sliders to highlight your amazing designs, a drag-and-drop page builder to easily create your own custom layouts and a portfolio section to display your previous works. Social icons allow you to connect your site to different social networks, while the blog is a perfect tool to share tips and other valuable content and build brand recognition. Along with unlimited customization options, responsive layouts and SEO-friendly code, the Impressive theme is a solid option to go with. The Madison theme was designed for interior design blogs but you can still use it for your corporate websites thanks to the array of business-related features and customization options available. The theme comes with beautiful image sliders to highlight your most important content, video support, and social media integration among other features. To simplify your work and to make it easy for potential customers to reach you, a pre-made contact page is included with the theme, and it features a Google map for people to find your exact geographical location. Madison’s other notable features include galleries, translation options and unlimited color options to help with branding. 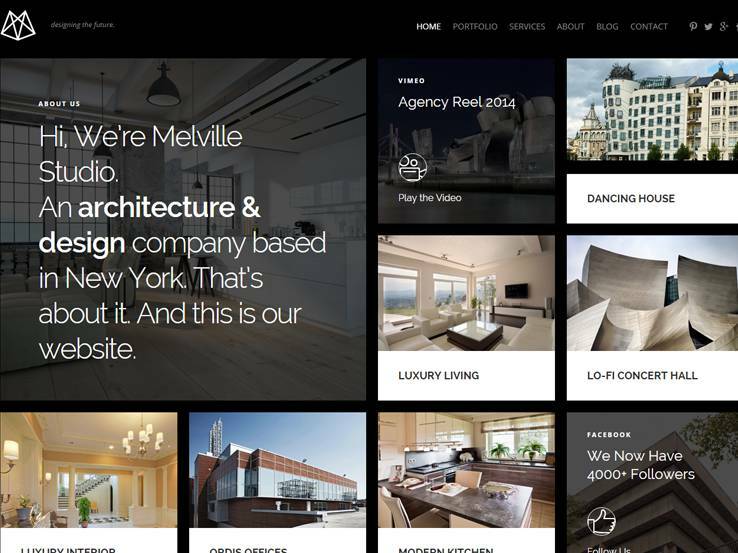 The Melville theme’s creative design combined with a wide range of business-related features and customization tools make it an ideal fit for interior designers. It is perfect for showcasing your amazing projects and other aspects of your interior design firm. The template comes with a filterable portfolio, eCommerce support as well as a working contact form for people to easily get in touch. Many customization options are included in the back-end, so you’ll have no problem modifying the theme to align with the rest of your brand. Besides, the Melville theme is fully responsive and is optimized to load fast and rank high in search engine results. 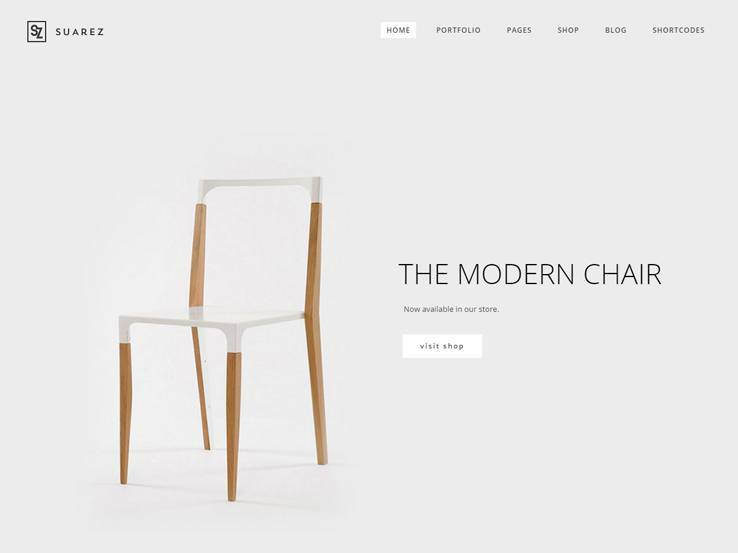 Want a modern, responsive eCommerce store to sell your furniture products online? 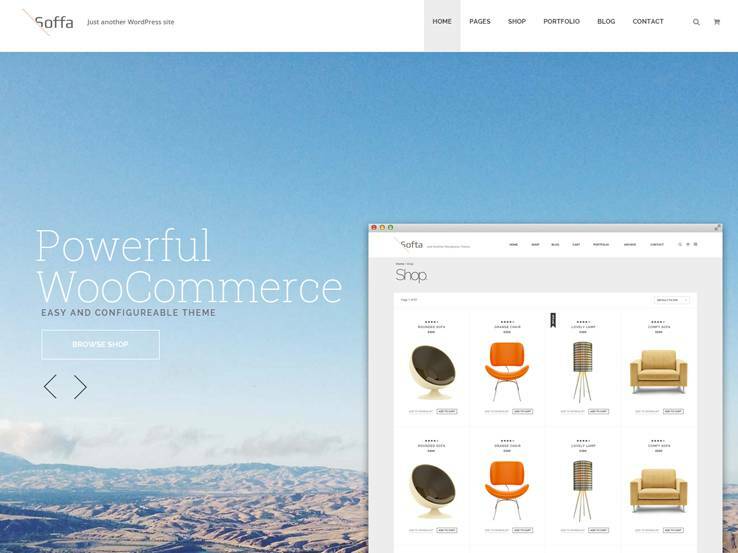 Consider the Furniture WooCommerce WordPress theme, which comes with powerful and user-friendly eCommerce features such as a shopping cart, catalog, product variations, and image sliders and carousels to highlight your best products. Behind the scenes, the Furniture theme includes an advanced admin panel with flexible customization options such as unlimited color schemes, Google fonts and social media options. You’ll also find several home demos to choose from as well as page templates for contact us, services, about us, and more. 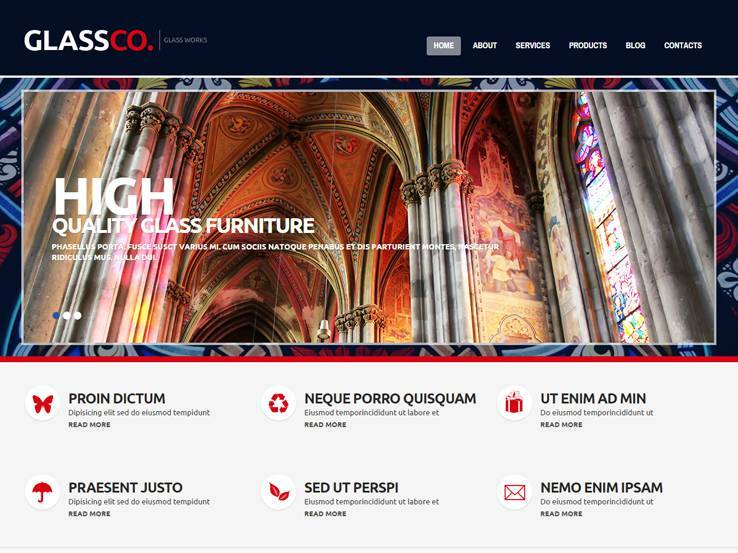 Koorsi is another brilliant option for furniture shop owners who want a simple yet feature-rich eCommerce WordPress theme to launch an online store for their products. The theme is powered by WooCommerce, and it comes with plenty of powerful features including full-width sliders to highlight your best designs, a portfolio module, catalog mode and video support. The Koorsi theme includes social media integration, so you’ll be able to promote your furniture shop on social networks like Facebook and Twitter. Better still, the template comes with many easy customization tools, including unlimited colors, logo upload, custom page layouts, custom widgets and a lot more. 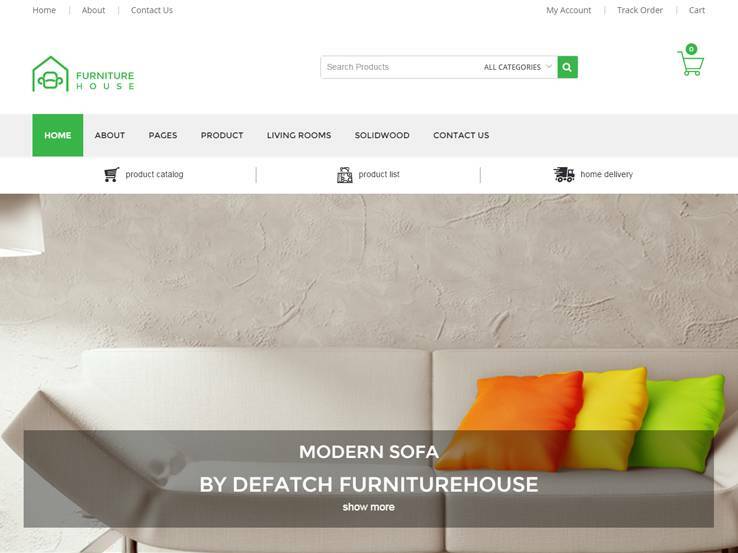 The Soffa theme has a clean and well-thought design aimed at helping you make more sales for your furniture business. 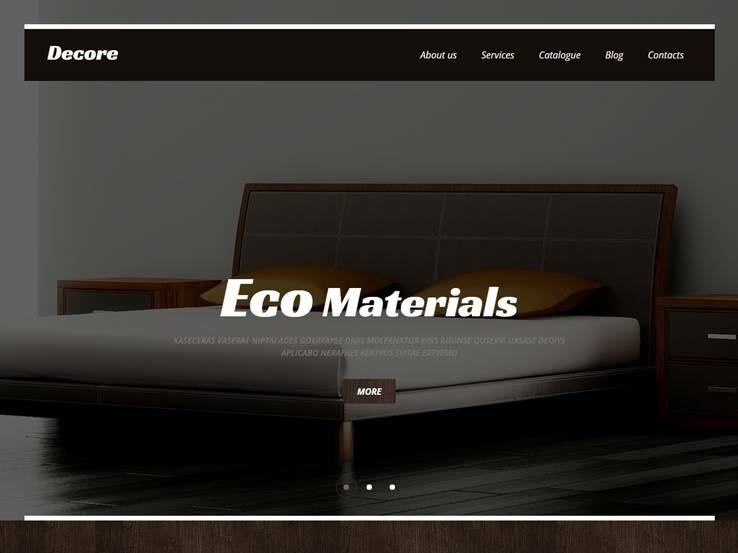 Perfect for creating an online furniture store, the template integrates nicely with the WooCommerce plugin and a number of other premium plugins such as the Visual Composer plugin for creating custom page layouts and the Revo Slider plugin, which makes it easy to create beautiful image sliders to highlight your best designs. To make your work easier, a number of pre-designed page templates are included with the theme, including contact us, testimonials, portfolio, pricing, team members and about us. You’ll also find 3 homepage designs to choose from and an email subscription form to collect emails from potential customers. 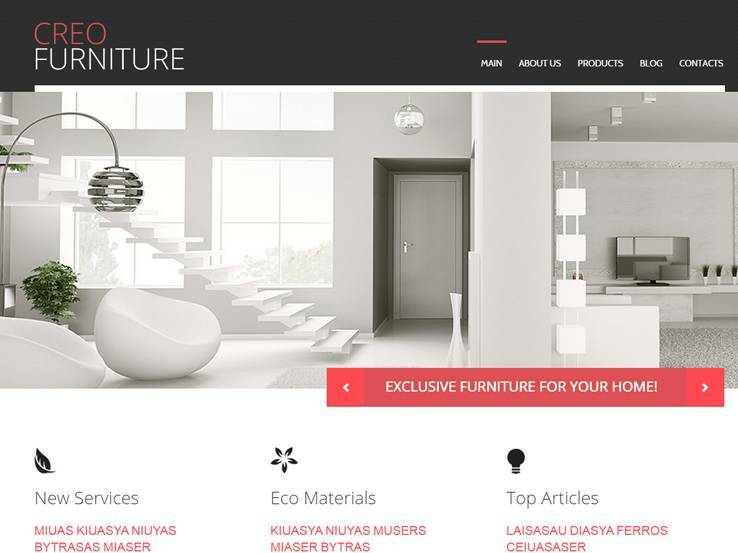 The Innova theme is a brilliant solution for both interior designers and furniture store owners. The template is clean and versatile with a rich feature-set that includes eCommerce support, a beautiful full-width image slider to highlight your best products on the main page, and a portfolio with various layout options. A spot to display your contact details is available in the header, and you can also display your social media icons for people to easily connect with you on different platforms. In addition, there’s a pre-made contact page that includes a map for potential customers to easily find your exact location. 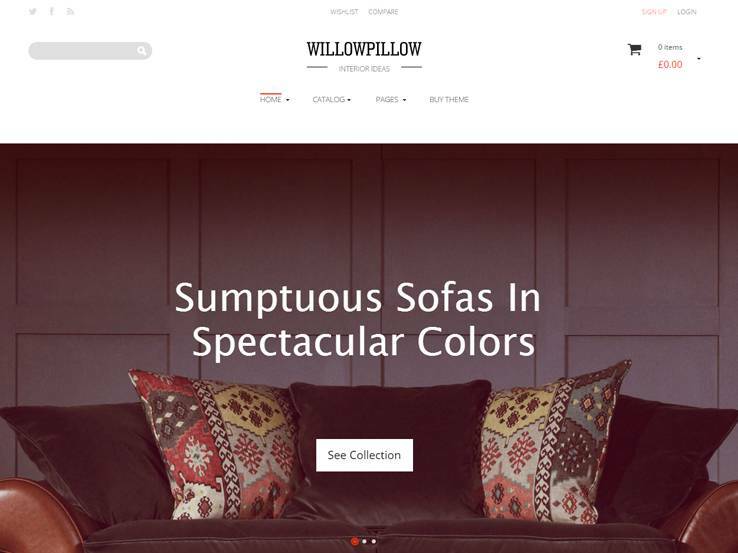 Willow Pillow is an easy and highly customizable WordPress theme perfect for creating an online store for your furniture business. Powered by the WooCommerce plugin, the template has conversion-optimized layouts to boost your sales, attractive product sliders and carousels, wishlists, product comparisons, catalog mode, and more. A powerful theme options panel makes it easy to customize the template according to your needs. You can control colors, backgrounds, typography, logo, and much more. You’ll also find custom widgets and social media icons to connect your site with Facebook, Instagram, Twitter and other social networks. The Za theme comes with several creative demo designs along with a drag-and-drop site builder to easily create your own custom layouts even without coding knowledge. The portfolio offers 4 different layouts for showcasing your works, and you can also highlight your best designs using the attractive image sliders. Support for the WooCommerce plugin means you can start selling your products or services online within minutes. Moreover, the Za theme includes some useful social media options and translation tools. You’ll also find a powerful theme options panel to easily control the look and feel of your website. 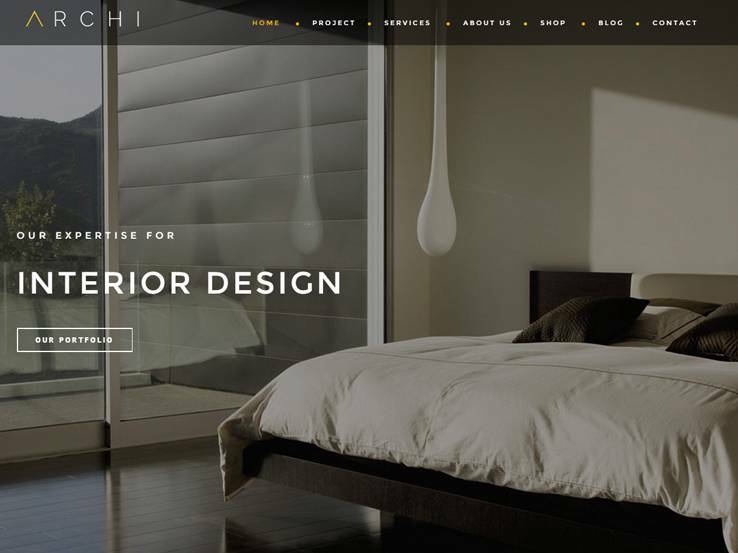 Archi is a beautiful and modern WordPress theme ideal for all kinds of interior design and furniture businesses. The template comes with a bunch of features that’ll make your website stand out from the crowd. Choose from over 18 homepage layouts with either dark or light skins, 7 different menu styles, unlimited colors and much more. A filterable portfolio makes it easy for users to find your projects, while eCommerce integration allows you to sell your products online without much effort. Along with beautiful image sliders, translation tools, a ready-made contact page, a blog, and lots of customization options, the Archi theme is certainly worth checking out. 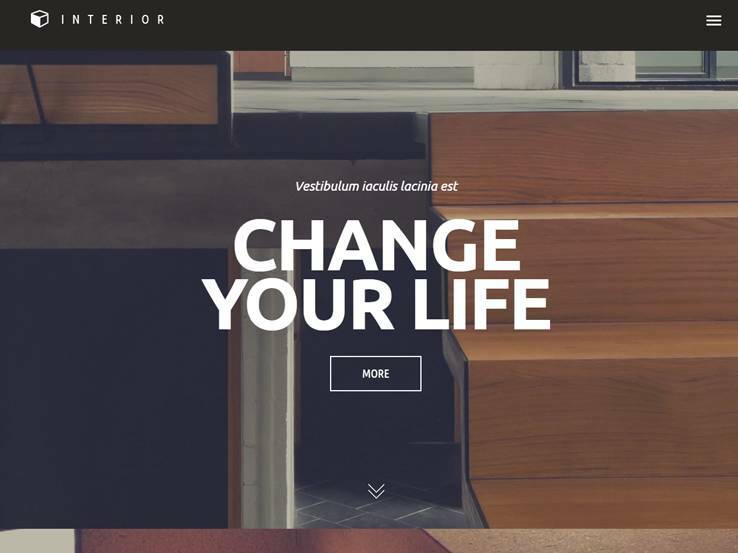 Modern Interior is a beautiful WordPress theme designed for interior designers. It features a fullscreeen slider that you can use to highlight your best designs, an easy-to-use page builder for creating your own custom layouts and an advanced portfolio to showcase your previous works. The fully responsive template adapts nicely to all screen sizes, and it includes tools to easily add information like testimonials, team members and galleries. 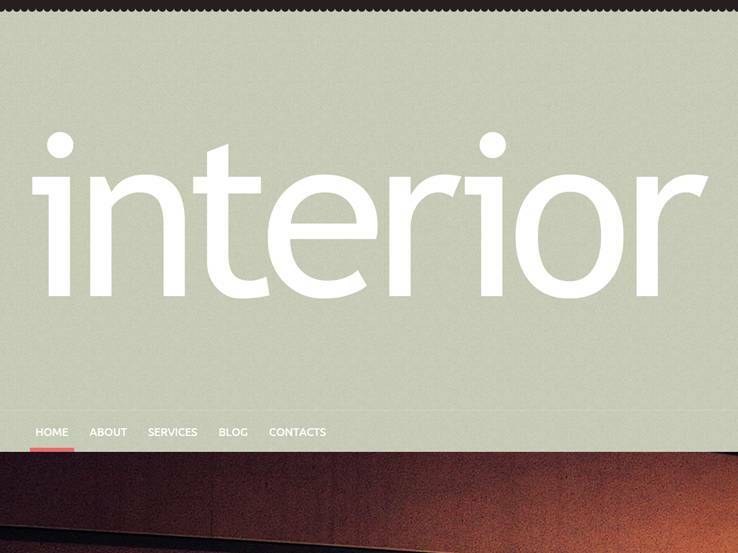 Along with social media icons, a clean and simple blog section, and powerful admin panel options, the Modern Interior theme is a solid option; so be sure to check it out. 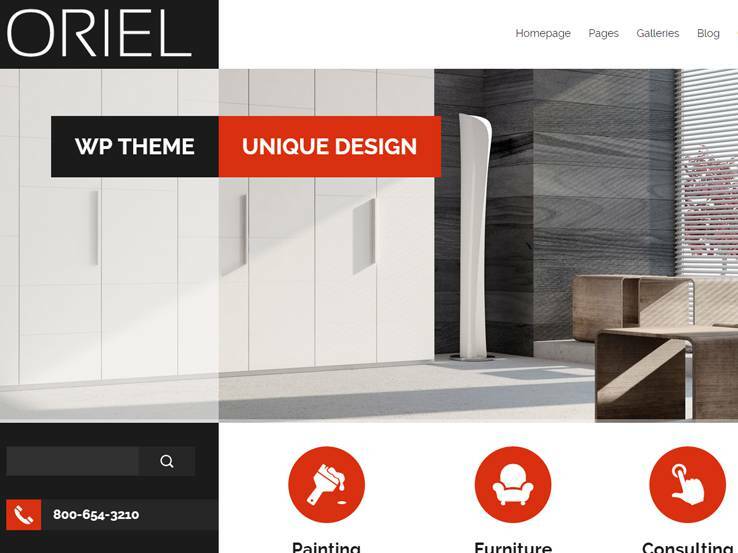 Meet Oriel, a fully responsive WordPress theme that’s ideal for interior designers and furniture stores alike. The theme demo has a unique design that features a left sidebar, an elegant full-width slider that’s perfect for highlighting your promotions and best designs, and a gallery module to present your photos. Use the blog to share tips and other valuable content that will boost your SEO and generate more traffic to your website. Besides, the Oriel theme supports eCommerce, so you can start selling your products online within minutes. The theme’s other notable features include pre-designed page templates, social media icons and carousels for displaying your client testimonials. 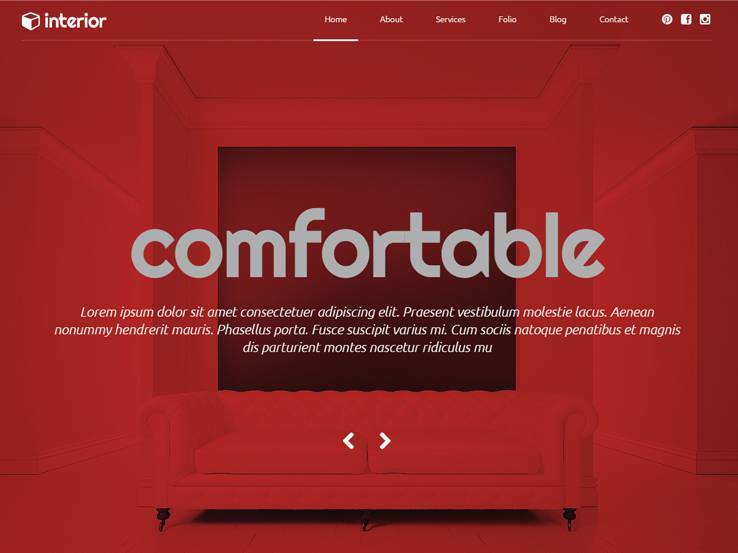 Koncept is a feature-rich multi-purpose WordPress theme that offers beautiful options for interior designers, consultants, furniture store owners, and more. The elegant template comes with multiple demo designs, which are all responsive. Create your own custom page layouts using a drag-and-drop page builder, and add attractive slideshows of your best designs. You’ll also find sections to feature your services, past projects, testimonials, contact details, and much more. 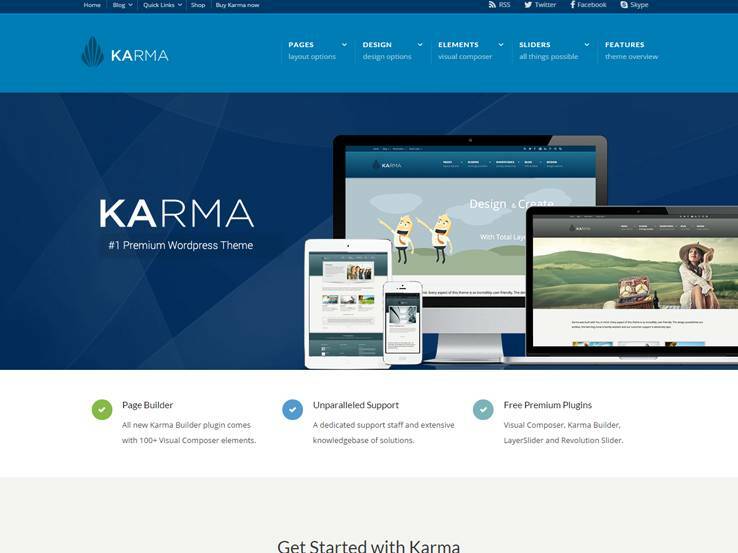 Consider the Karma WordPress theme if you want a clean and professional-looking website for your interior design or furniture business. The fully responsive theme brings well-organized layouts, a wide range of ready-made page templates to make your work easier and lots of design options and elements so you can achieve a unique website. The visual page builder makes it easy to create your own custom pages, and you’ll find social media icons, eCommerce support, and an advanced admin panel with lots of customization options. Also, the Karma theme is search engine-friendly, and the theme developers provide top-notch support in case you run into any issues with the template. 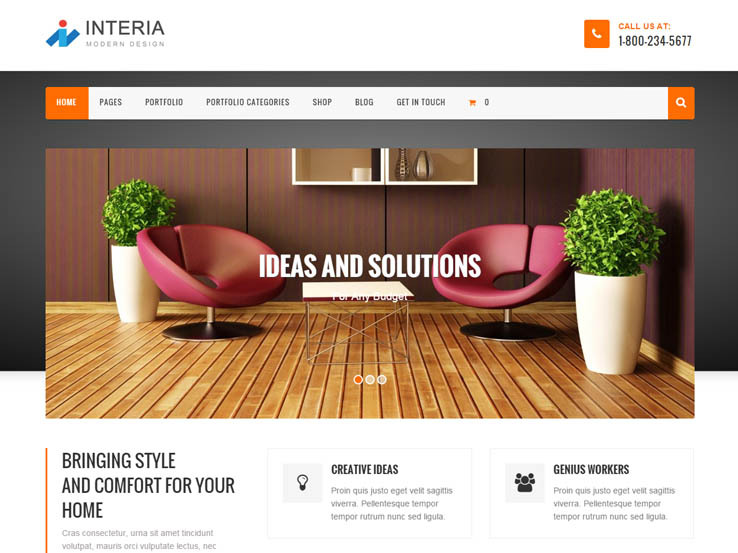 The Interia theme is another great option for interior design websites. It looks great on all types of devices and screen sizes, and it packs a number of impressive features. You can easily create custom page layouts using the drag-and-drop page builder, while the live customizer allows you to see previews of the changes you make to your site. eCommerce support means you can easily start selling straight from your site, while the blog offers a great opportunity to share your knowledge and generate more traffic from search engines and social media platforms. In addition, you’ll find pre-made page templates for sections like about us and contact us. Megalithe by ZigZagPress offers a stunning grid-based layout for the ultimate portfolio website. 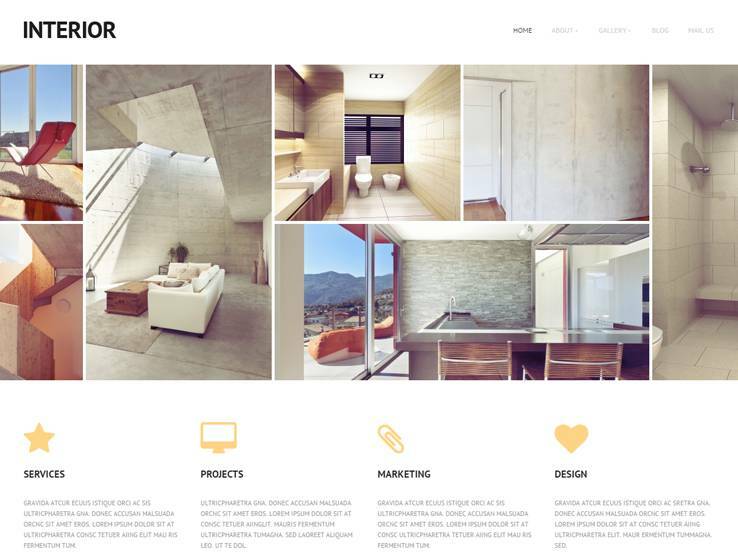 The theme works wonders for interior designers; it’s easy to setup your portfolio and get professional-looking results. Megalithe is completely responsive, meaning people can view them on just about any device such as tablets and smartphones. You can choose from seven pre-designed color skins, making it easier to create a color scheme matching your brand. The social media buttons can be placed in the header, sidebars or footer, and you even receive a few modules at the top of the page to display contact information. Megalithe comes with a beautiful slider which supports overlaying text, allowing you to place a title and description on each of your photos. Insert a contact page on your site and use the shortcodes to add notification boxes, sliders, testimonials, and more. The portfolio is the star of this theme since it features various layouts with multiple columns. Additionally, the blog page is the ideal place to publish relevant content and boost your search engine rankings. Along with several widgets for contact info, social media buttons, Flickr photos, and recent posts, you can also put filters on your portfolios to make the browsing experience easier.